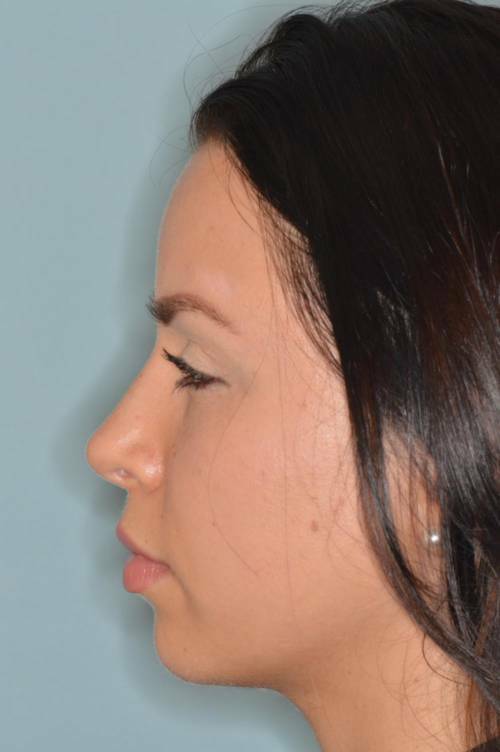 Before and 3 months after primary rhinoplasty to help correct a deviated nose. 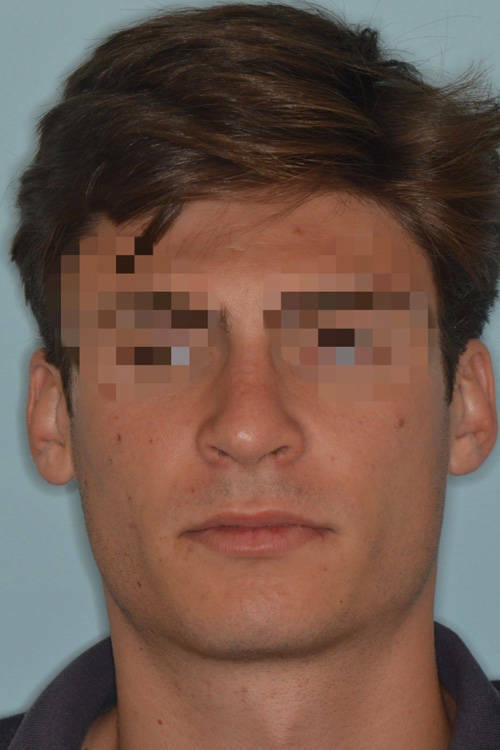 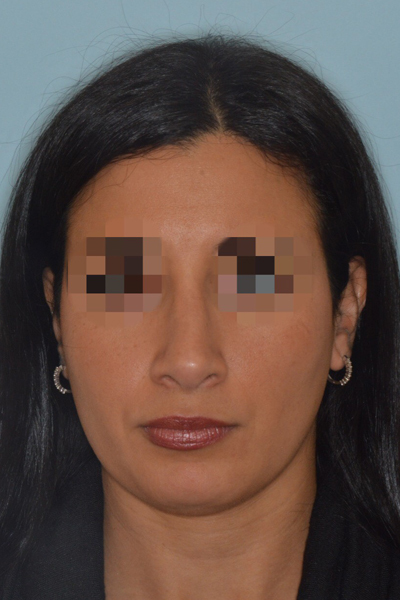 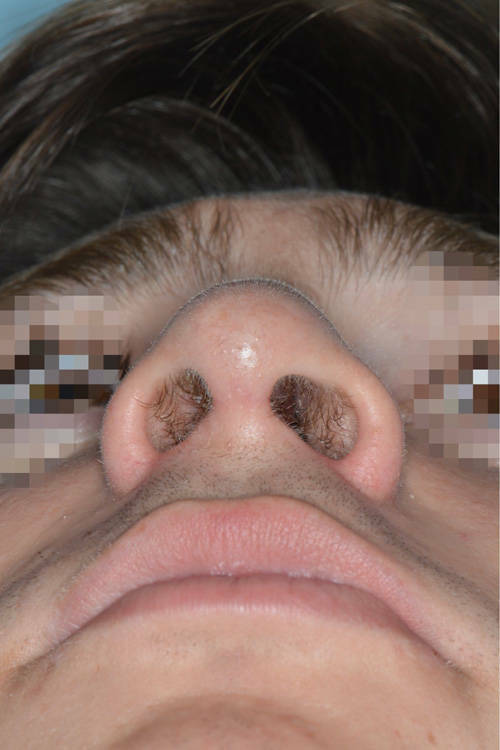 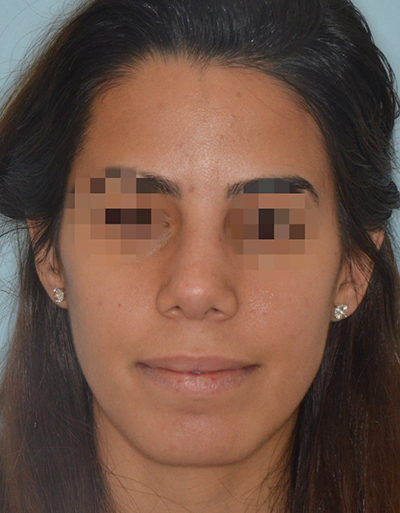 This patient presents with the very challenging finding of a deviated nose where the entire lower two-thirds of the nose is deviated to the right side. 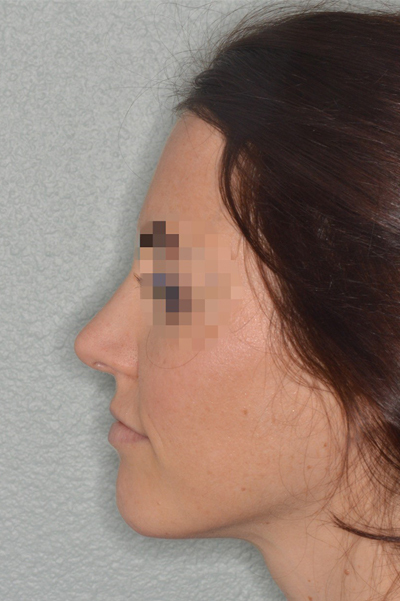 Rhinoplasty techniques included an extracorporeal septoplasty which is a very advanced septoplasty technique where the entire septum is removed and reconstructed then replaced. 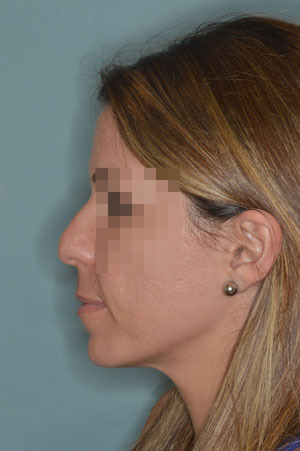 A hump reduction and slight tip elevation was also performed to improve the aesthetics of the profile as were the patient’s goals. 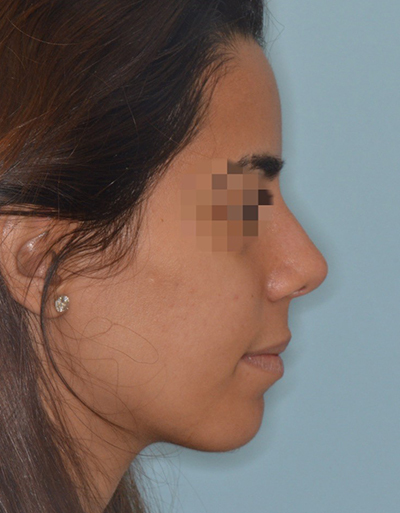 Patient who desired refinements to her profile and the shape of her tip. 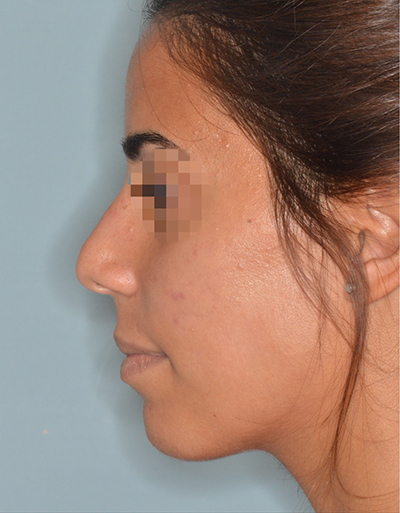 Primary rhinoplasty techniques included hump reduction, bilateral osteotomies, bilateral spreader grafts, caudal septal extension graft for tip support, lateral crural repositioning with lateral crural strut grafts, and tip onlay graft. 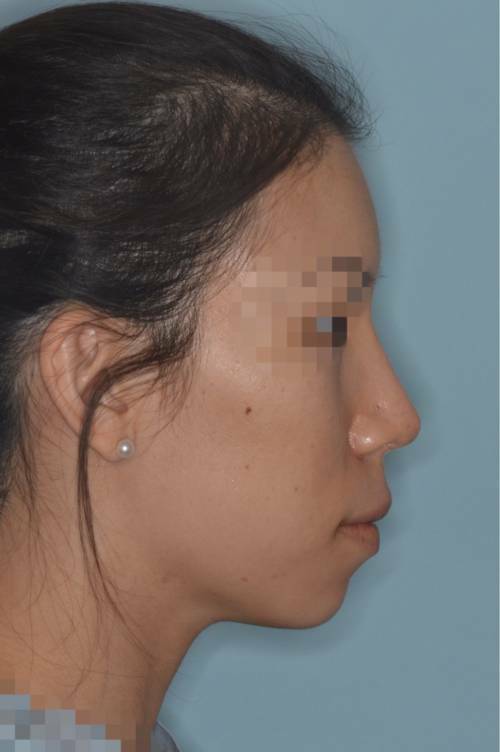 She has vertically oriented tip cartilages thus to give the most natural tip refinement appearance, the tip cartilages were repositioned. 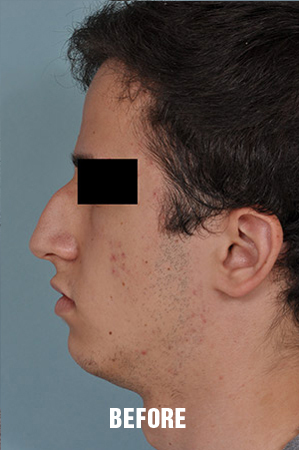 9 month long term follow photos are provided. 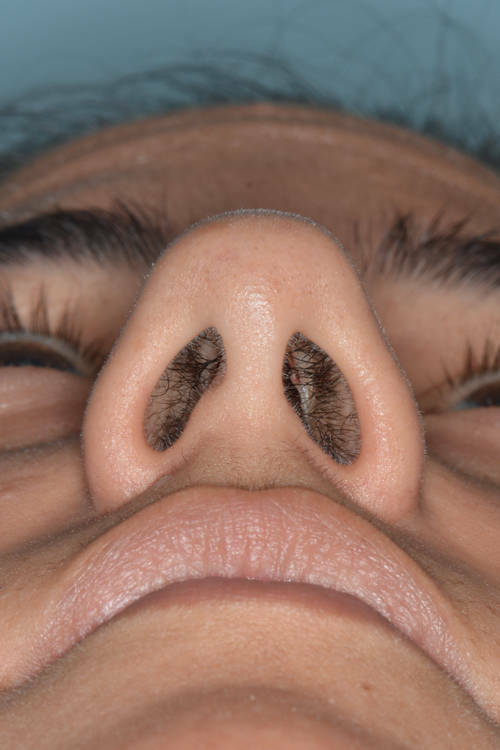 Female patient who wanted to refine her tip. 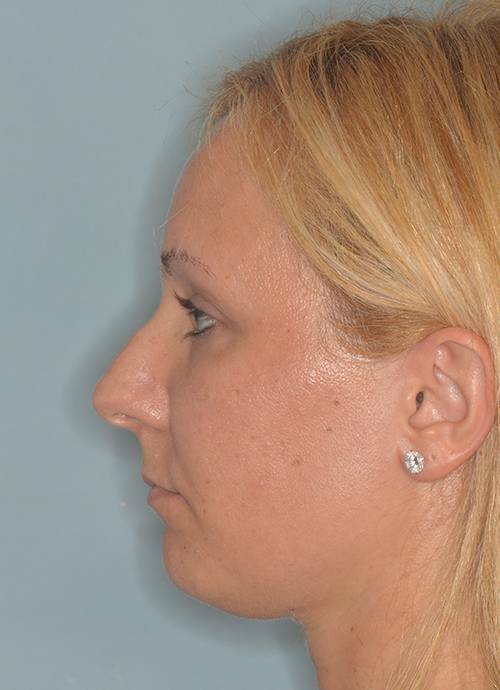 She was displeased with the bulbous shape of the tip from the front and the profile of the tip and the bridge. 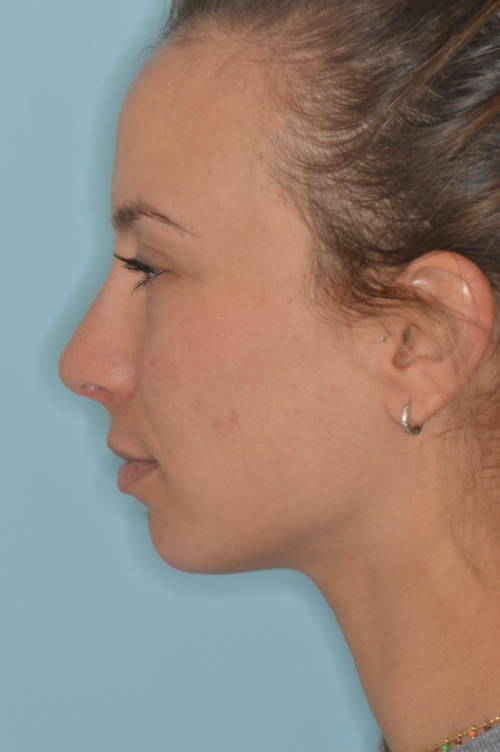 Primary rhinoplasty techniques included bilateral osteotomies to narrow bridge. 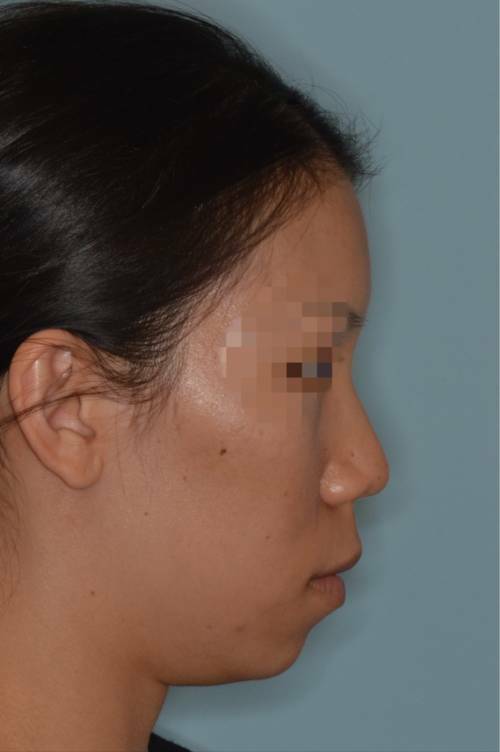 Tip refinement techniques included the repositioning of the lower lateral cartilages with lateral crural strut grafts and tip support with a caudal septal extension graft. 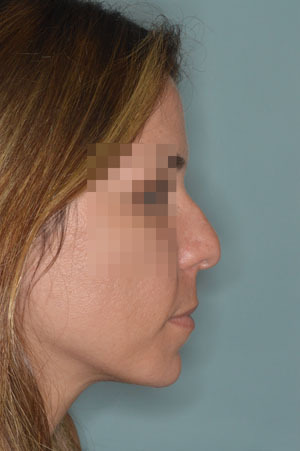 These tip refinement techniques were employed to give a natural appearance to the outcome. 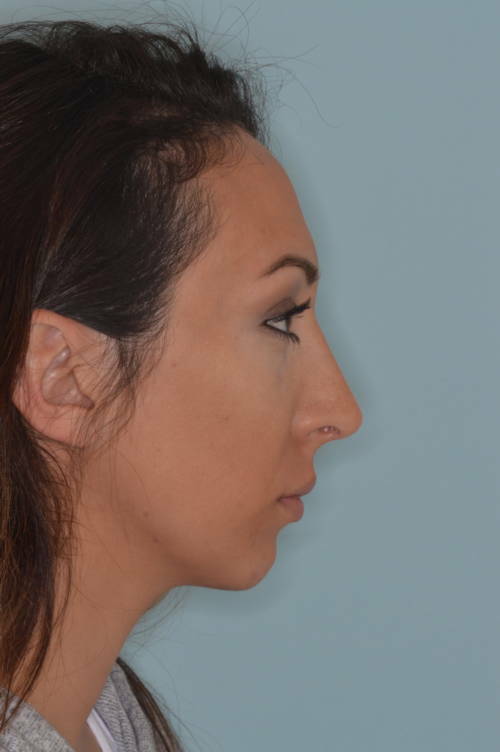 The most challenging aspect of this primary rhinoplasty is not the reduction of the hump on the profile but rather the attainment of tip refinement while providing for a natural tip aesthetic outcome. 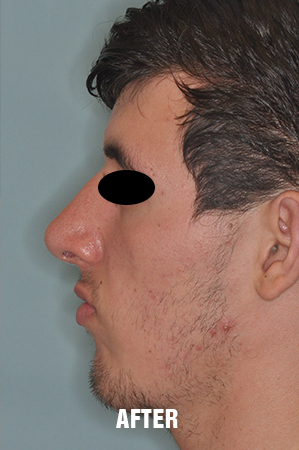 In this case primary rhinoplasty techniques included open approach, hump reduction, osteotomies, bilateral spreader grafts, caudal septal extension graft for tip support, tip cartilage repositioning with lateral crural strut grafts, and tip onlay graft. 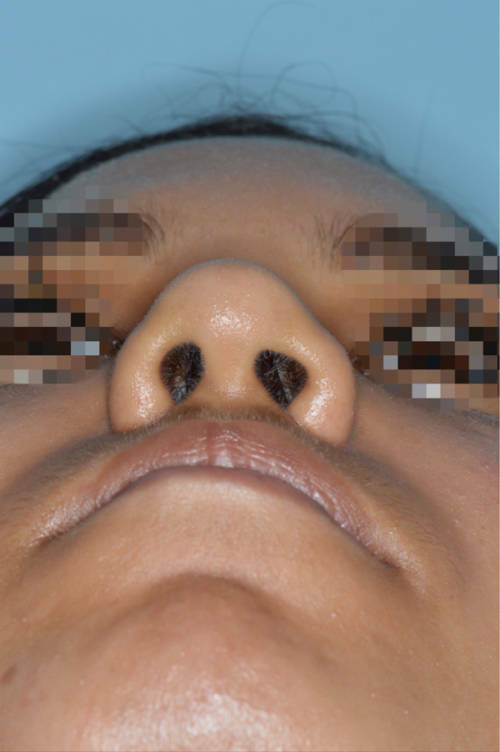 Challenging case of a female patient with a severely crooked nose. 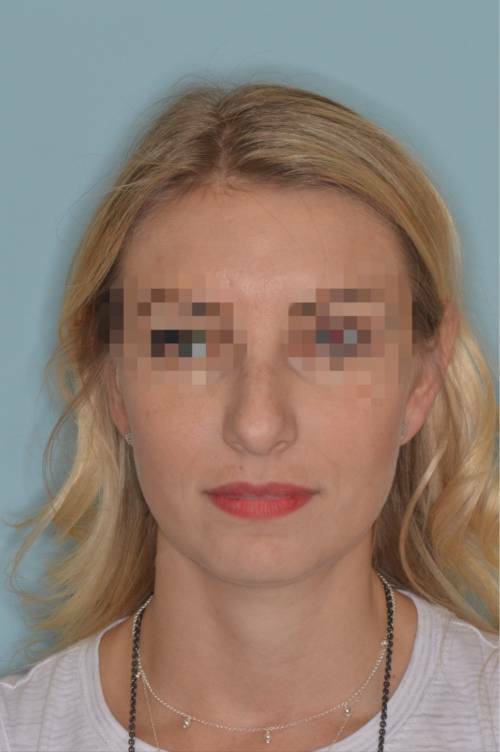 Primary rhinoplasty techniques included an open rhinoplasty approach, right-sided osteotomy, bilateral spreader grafts, clocking suture, footplate suture, temporalis fascia onlay grafts, caudal septal extension graft, and tip onlay graft. 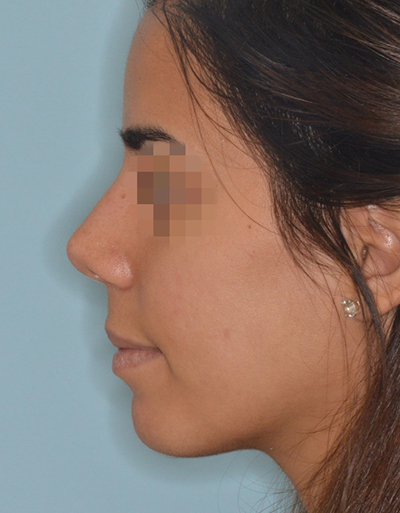 Complicated rhinoplasty for a traumatic saddle nose deformity. 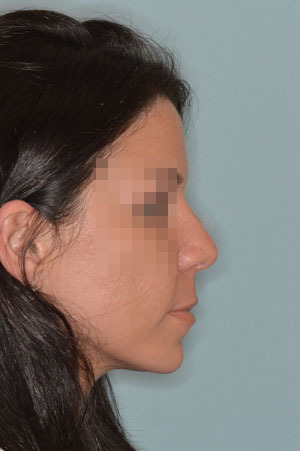 In this case, the part of the nose that is composed of cartilage had disarticulated from the bone resulting in what is called a saddle nose deformity. 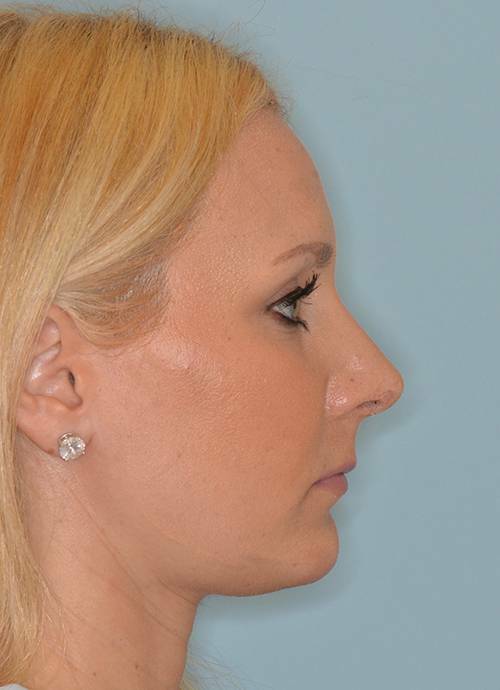 Rib cartilage was used to rebuild the middle vault of the nose and counter-rotate the nose. 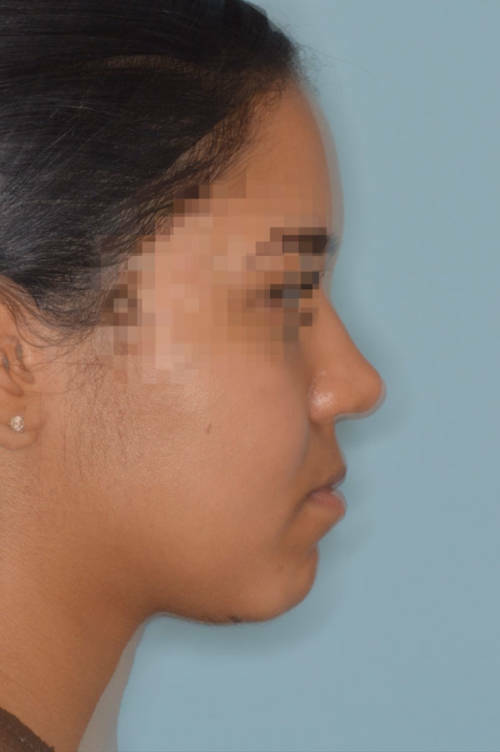 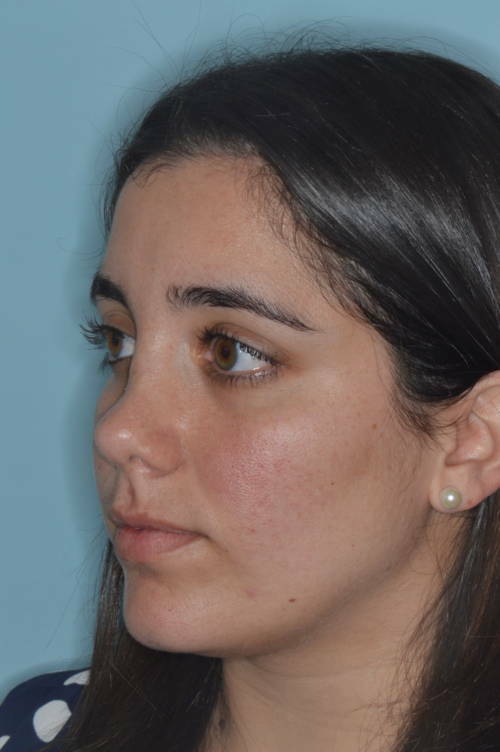 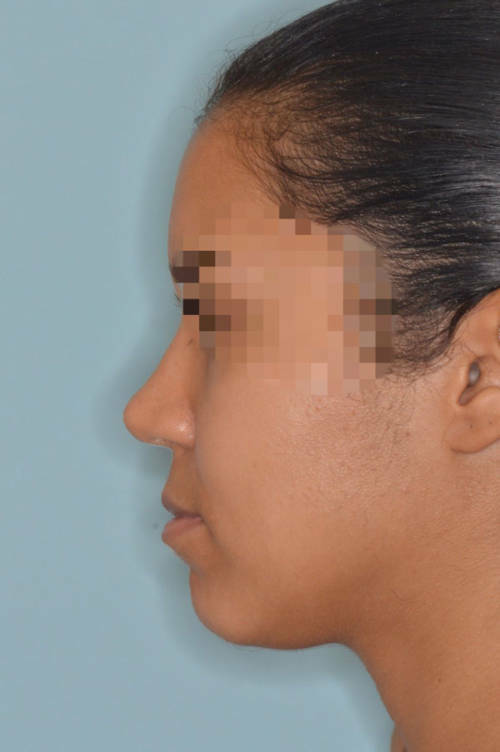 Female patient who desired to reduce the appearance of the hump on the profile view of the nose. 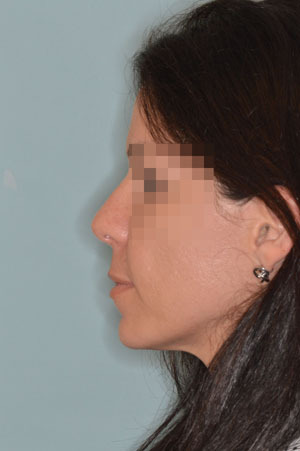 Primary rhinoplasty techniques included an open approach, bilateral osteotomies, hump reduction, bilateral spreader grafts, caudal septal extension graft, and tip onlay graft. 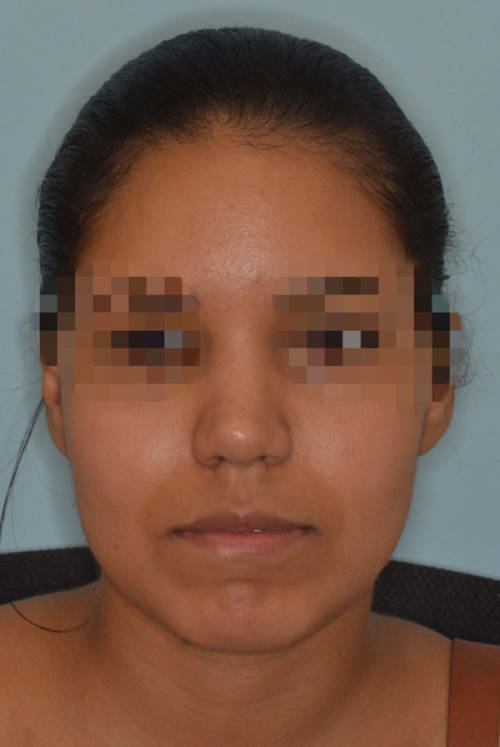 She is seen here 4 months after surgery. 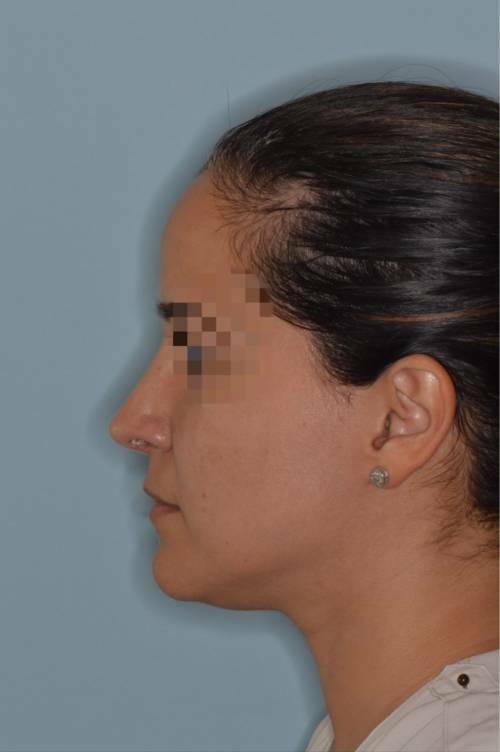 Female patient whose cosmetic concerns included tip refinement, tip elevation, and the hump on her profile view. 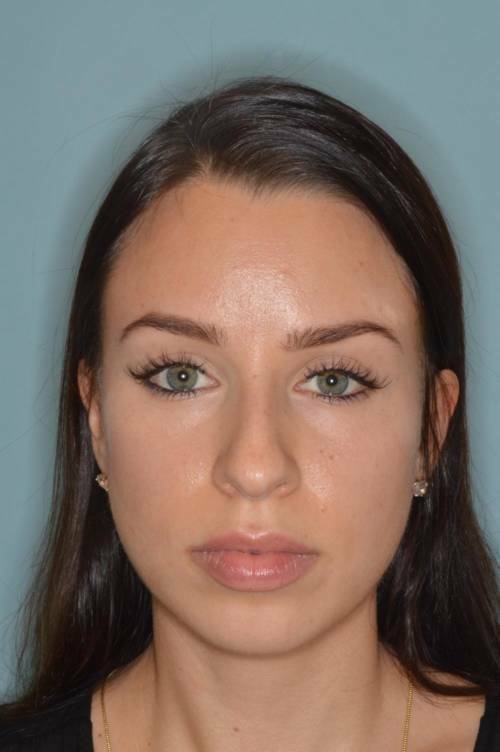 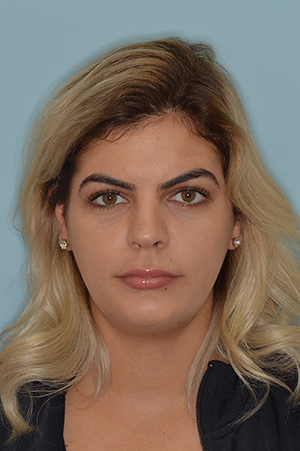 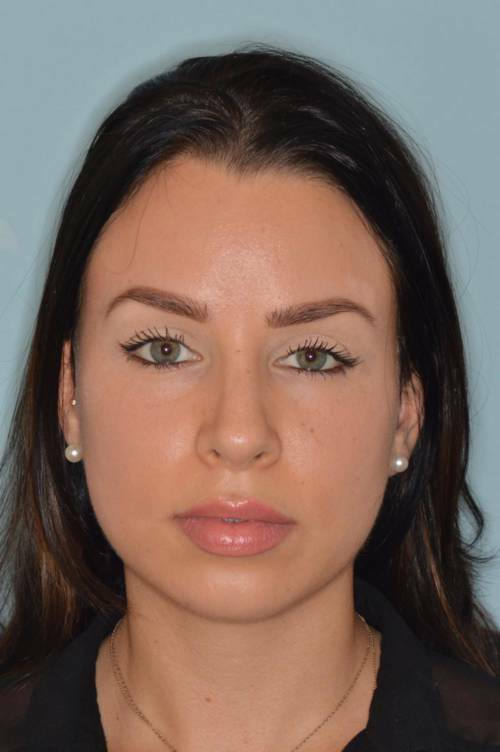 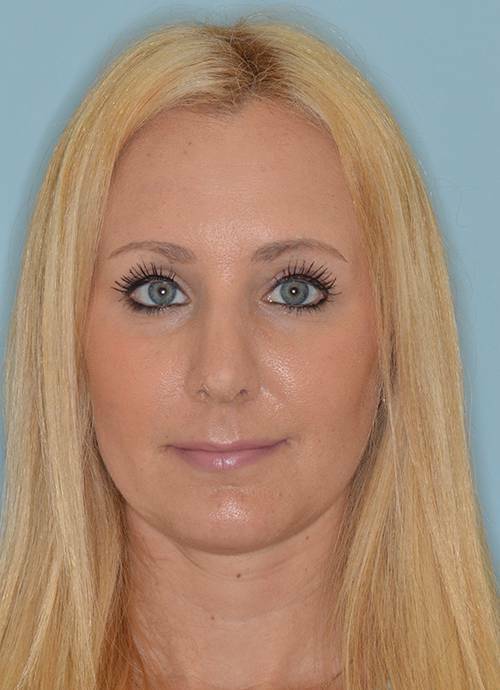 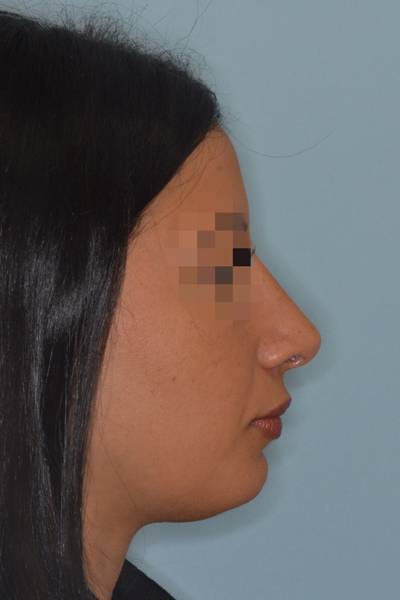 She underwent a primary rhinoplasty with a hump reduction, osteotomies, and caudal septal extension graft for tip support. 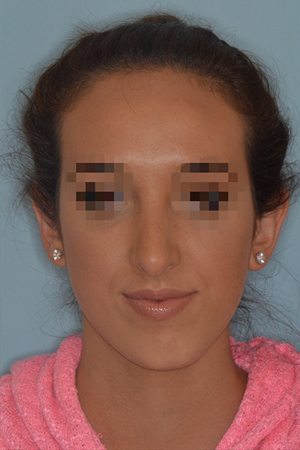 Female patient with a crooked nose and deviated tip. 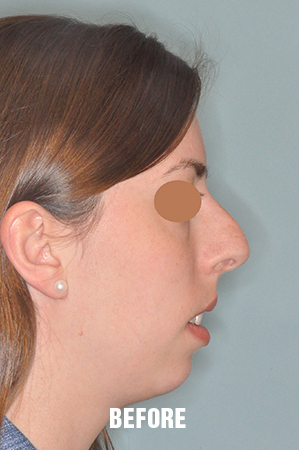 She also desired the refinement of her tip and the alignment of her profile view. 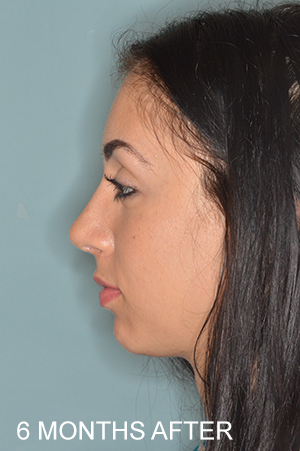 The crooked and deviated tip is a very challenging feature to improve upon in rhinoplasty. 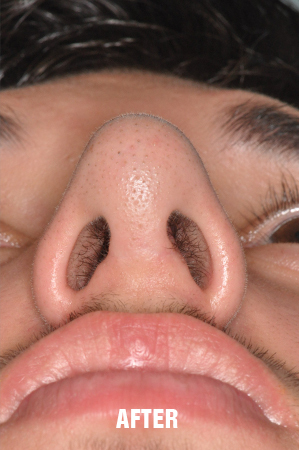 Intra-operative maneuvers entailed the asymmetric placement of spreader grafts and a clocking suture technique. 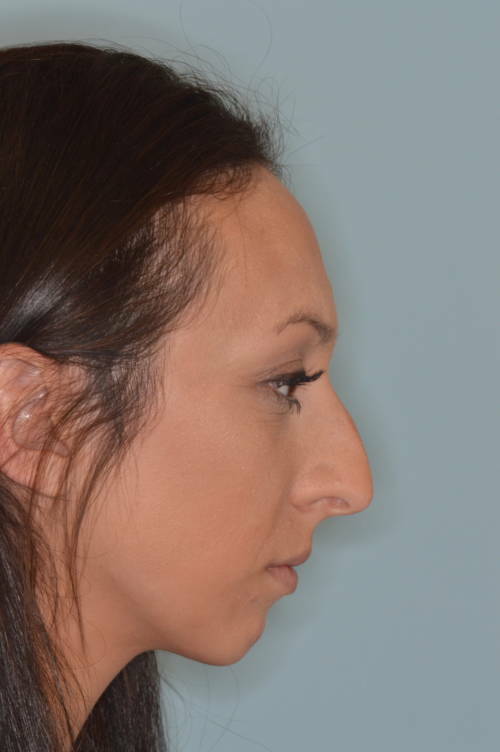 Hump reduction and tip refinements were also made. 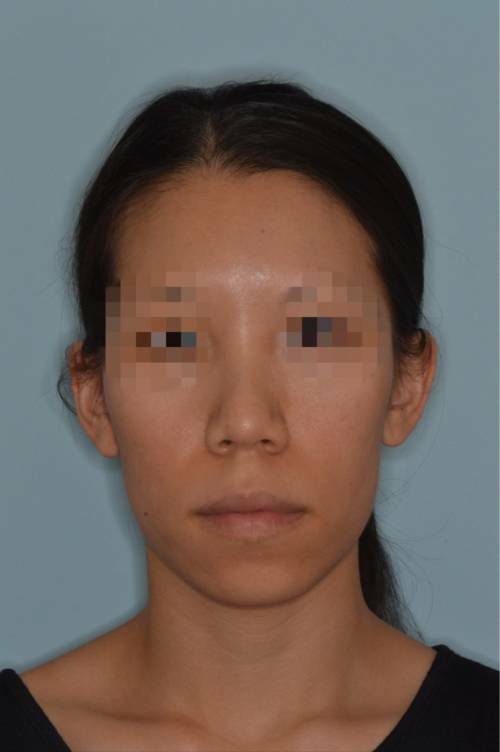 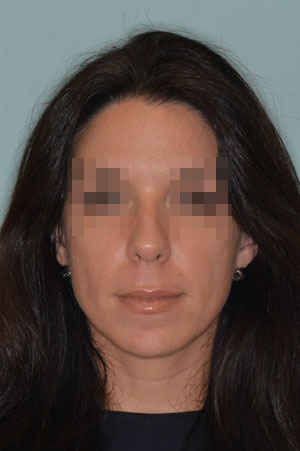 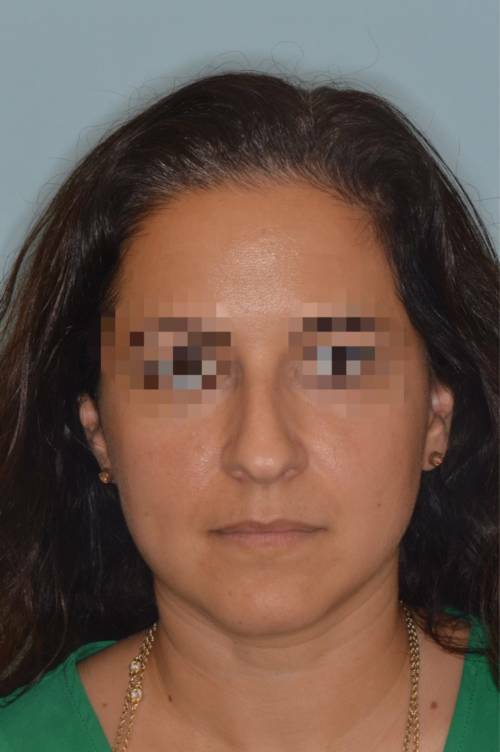 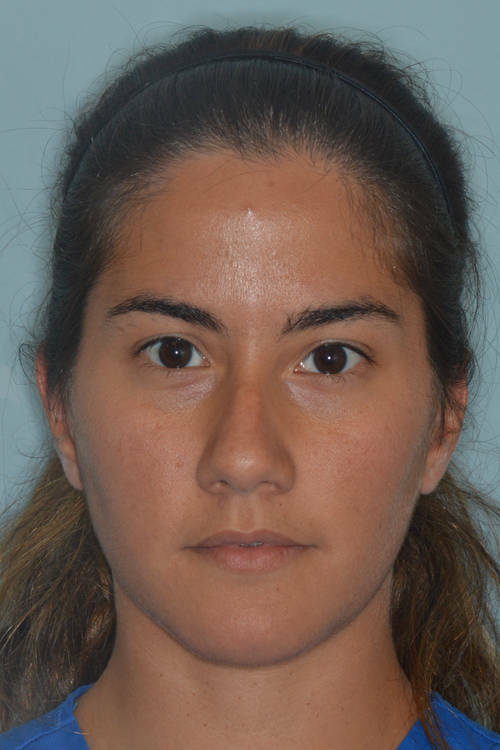 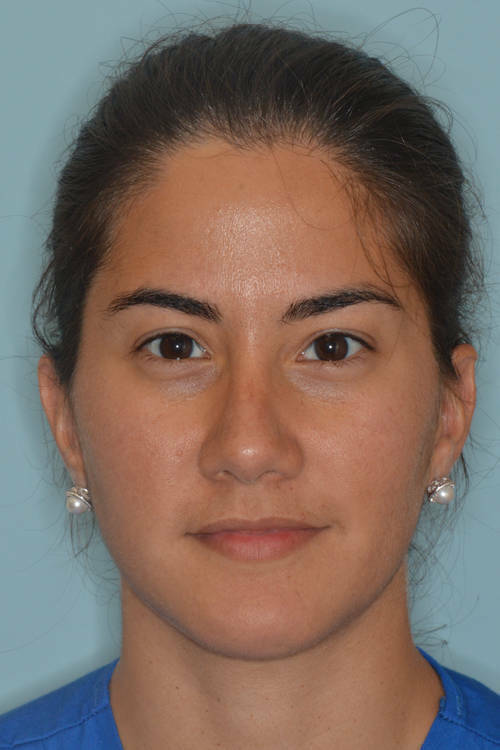 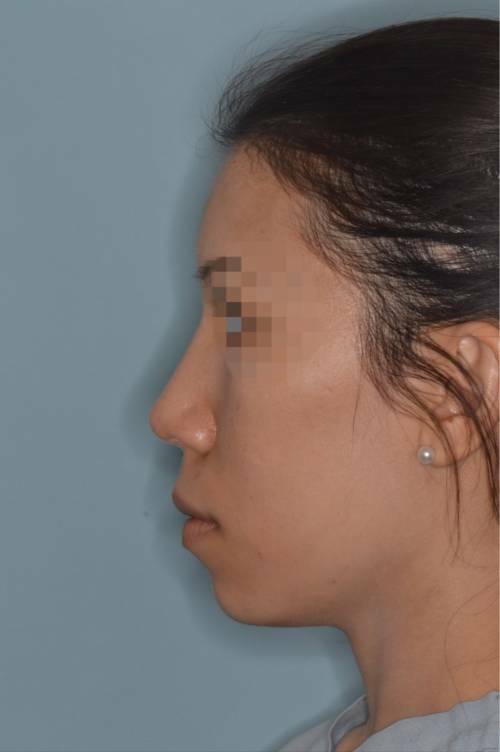 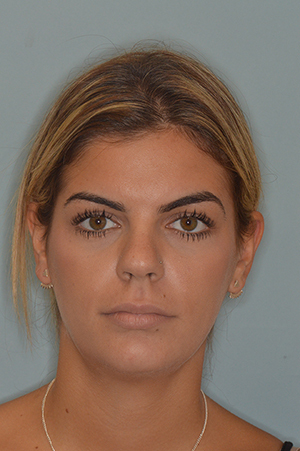 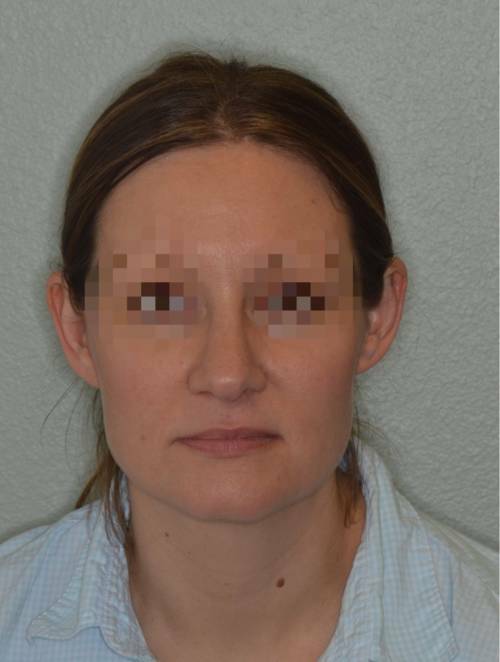 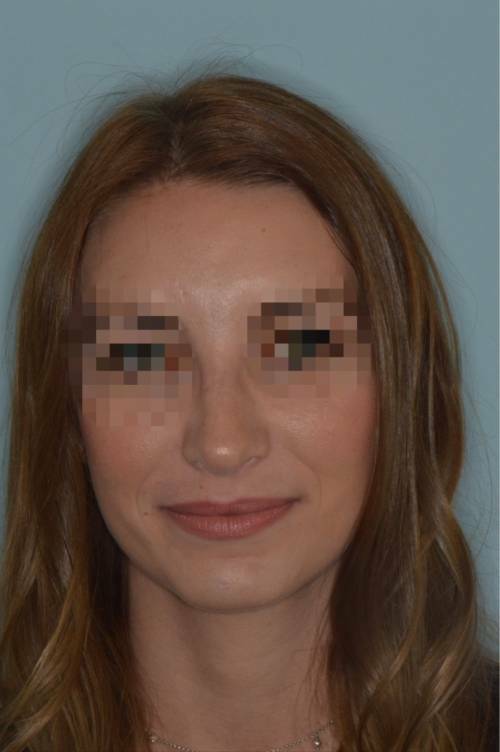 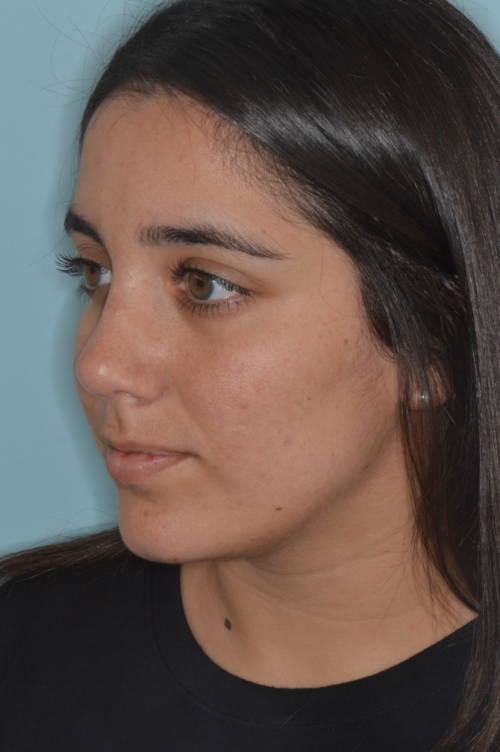 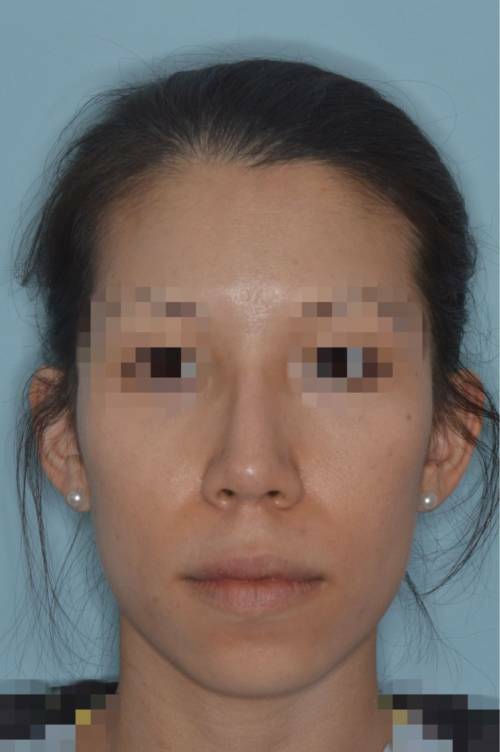 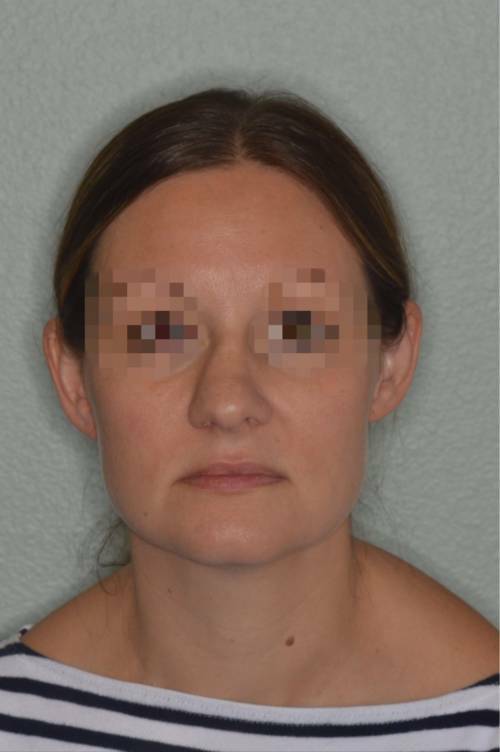 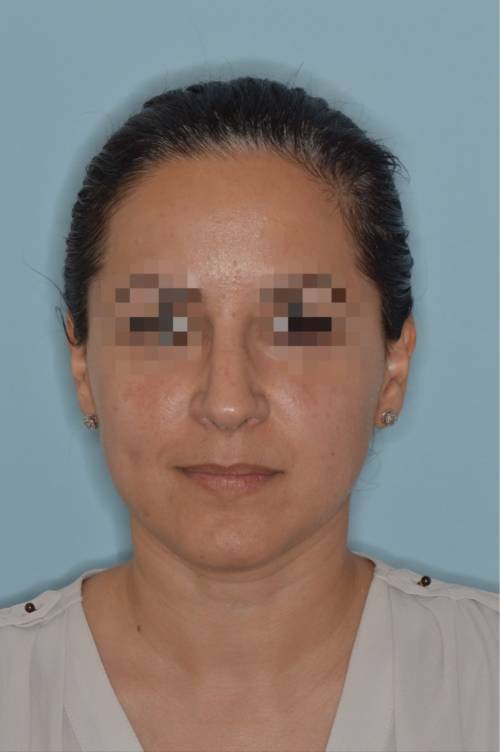 Seen here in her post-operative photos are a significant improvement in her nasal tip deviation and the other refinements made to the nose including the reduction of the hump on the profile view. 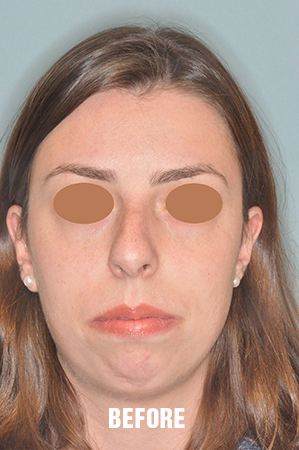 Female patient whose primary concerns were the width of her nose and bulbous tip from the front view. 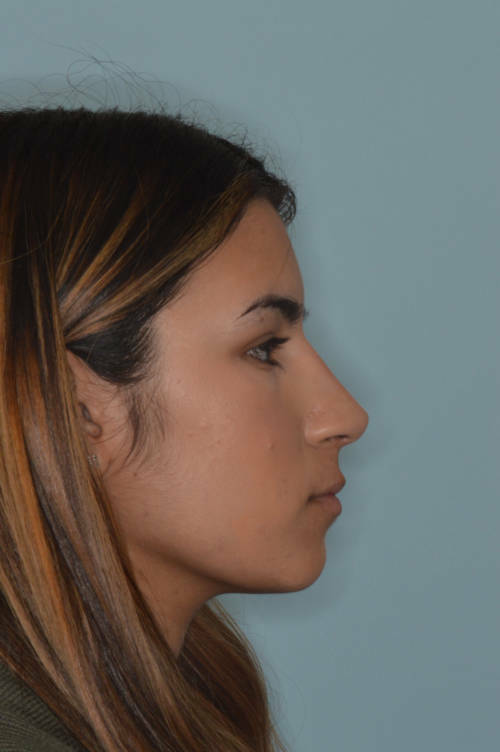 On further examination, she was noted to have thicker nasal skin and vertically oriented nasal tip cartilages. In order to refine the tip significantly given her thick skin and adhere to natural-appearing results, her tip cartilages were repositioned using lateral crural strut grafts. 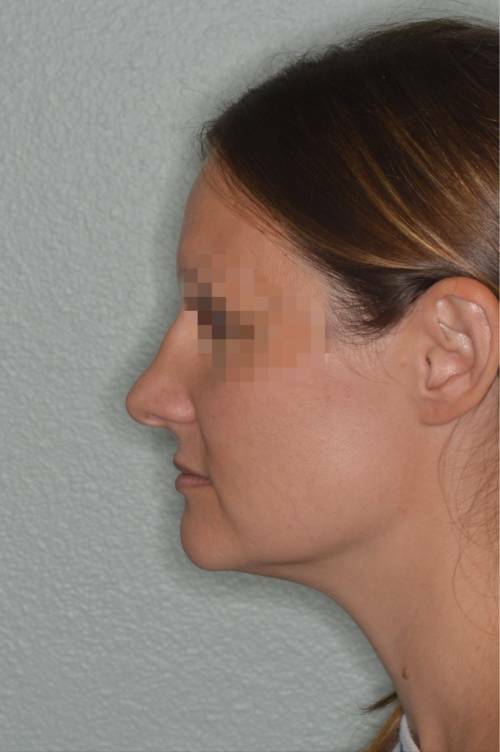 Other techniques employed include open rhinoplasty approach, bilateral osteotomies, caudal septal extension graft, and tip onlay graft. 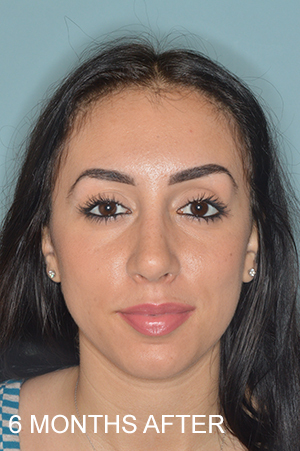 Asian female patient who desired to have refinements to her tip and bridge. 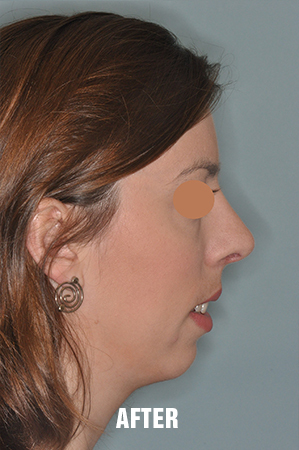 The bridge was refined by narrowing and raising the bridge of her nose. 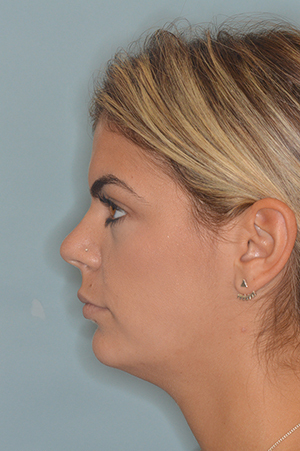 Bridge refinement was achieved with osteotomies and augmentation using temporalis fascia and diced cartilage grafting. 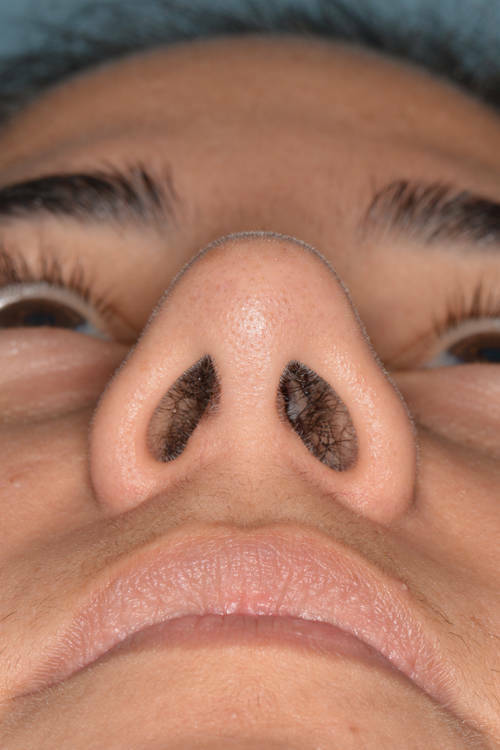 The tip was narrowed and refined using a tip graft. 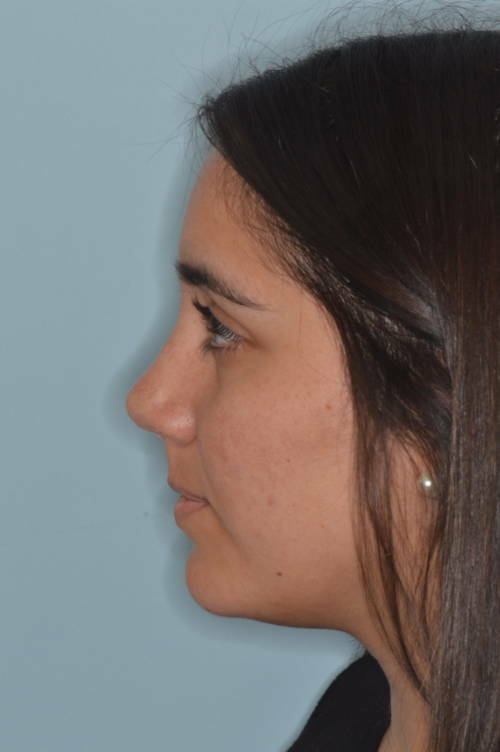 Challenging case of Hispanic rhinoplasty of a patient with very thick nasal skin and a wide nose. 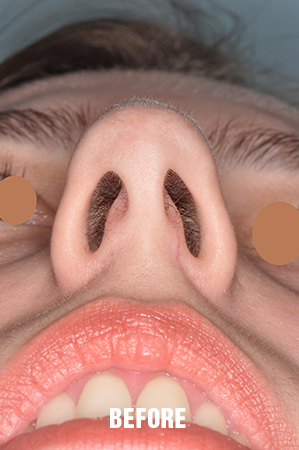 Primary rhinoplasty techniques included bilateral osteotomies, defatting of the nasal skin, tip onlay grafts, and alar flare reduction incisions. 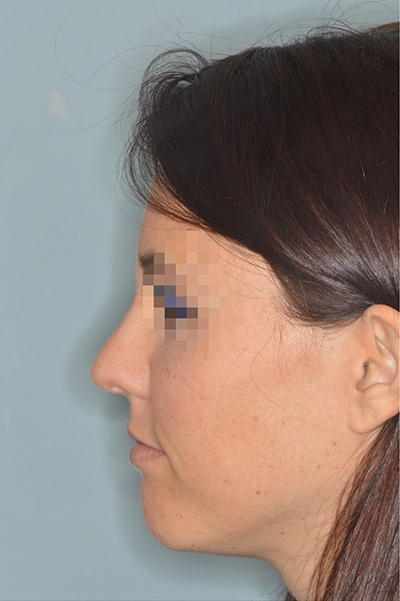 Techniques performed to provide for narrowing of the nose while preserving a natural appearing outcome. 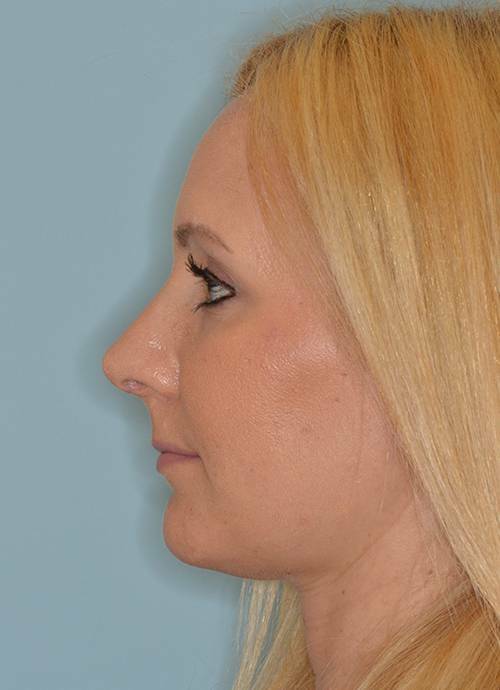 Alar flare reductions allow for the narrowing and the thinning of the base of the nose while maintaining the nostril size the same. 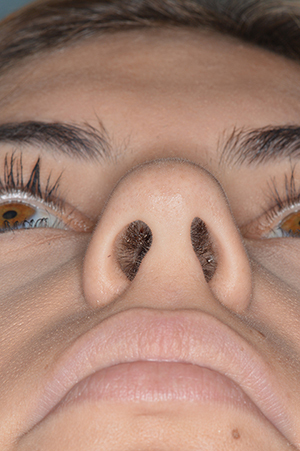 In this case, her nostril size were small but the nasal flare was wide. 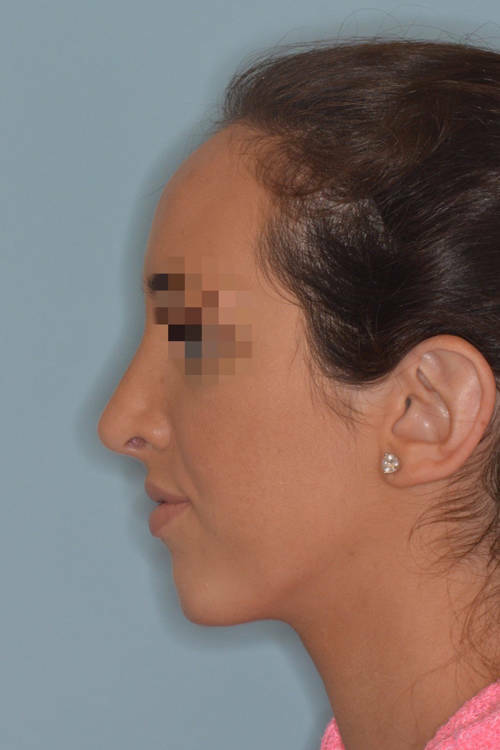 Patients concerns included the hump on the profile view and the tip. 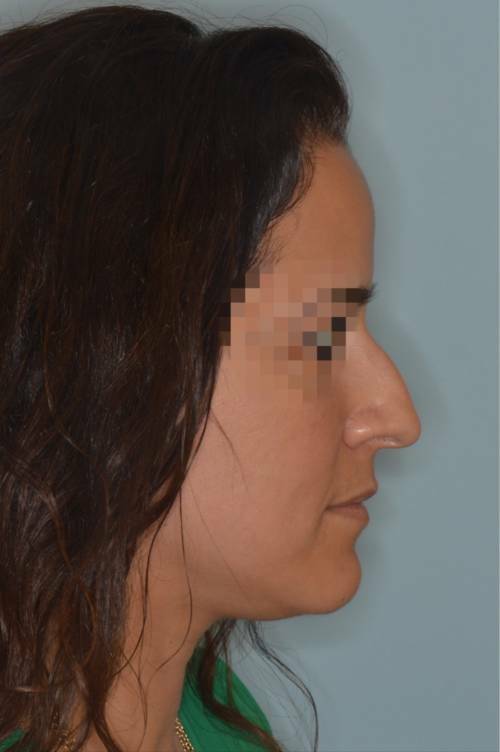 Rhinoplasty techniques included hump reduction, osteotomies, bilateral spreader grafts, tongue-in-groove tip setback, and tip onlay grafts. 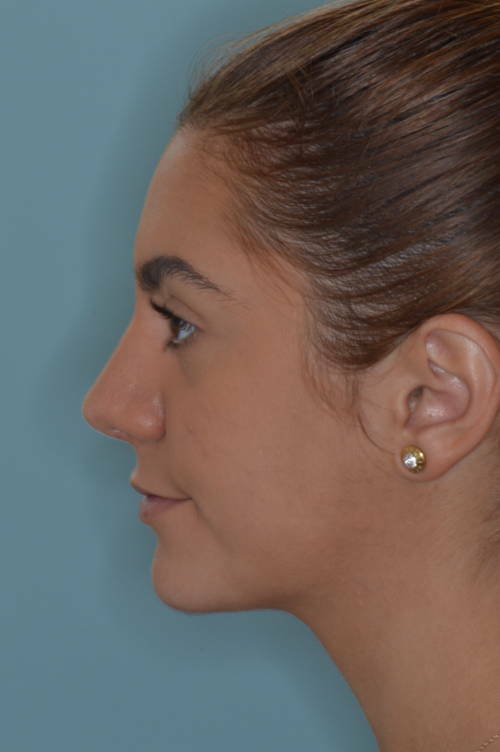 Tip cartilage support and repositioning was accomplished by a tongue-in-groove technique where the existing septum was used to help shorten the appearance of the profile and the hanging columella. 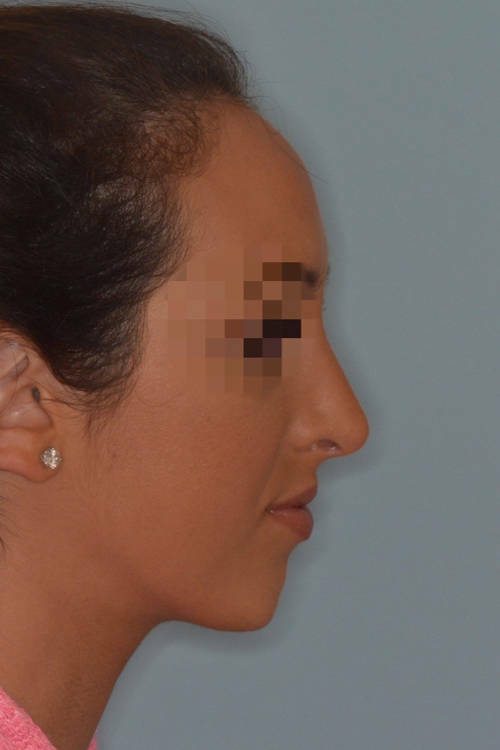 Patient presented with complaints of large, over-projected nose, a large hump as well as nasal breathing difficulty. 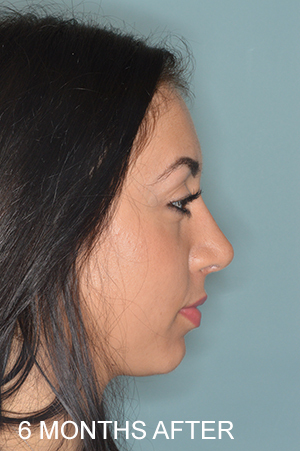 Primary rhinoplasty was performed with septoplasty, hump reduction, and spreader grafts. 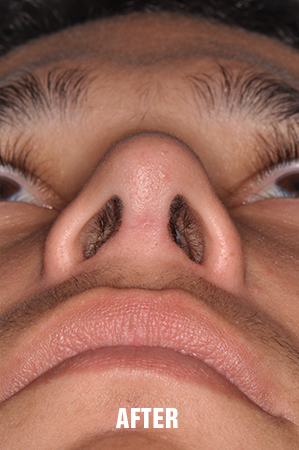 A ‘toungue-in-groove’ technique was utilized for tip support whereby his tip cartilages were set back onto his septum. 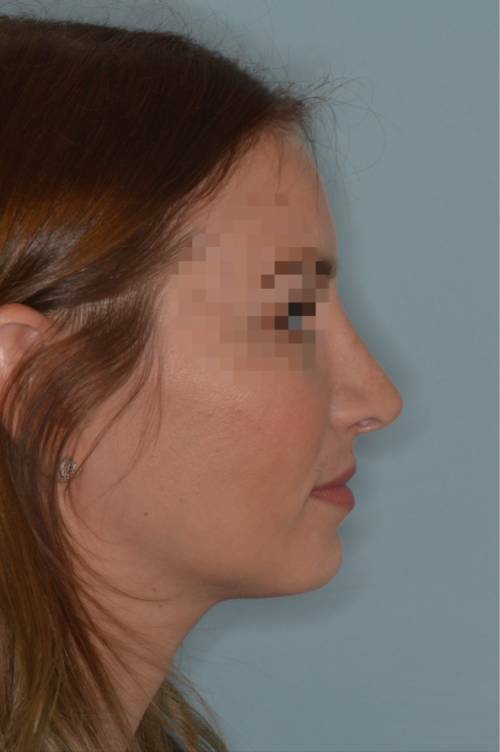 This technique allows for long term tip support as well as for the decrease in projection of the tip. 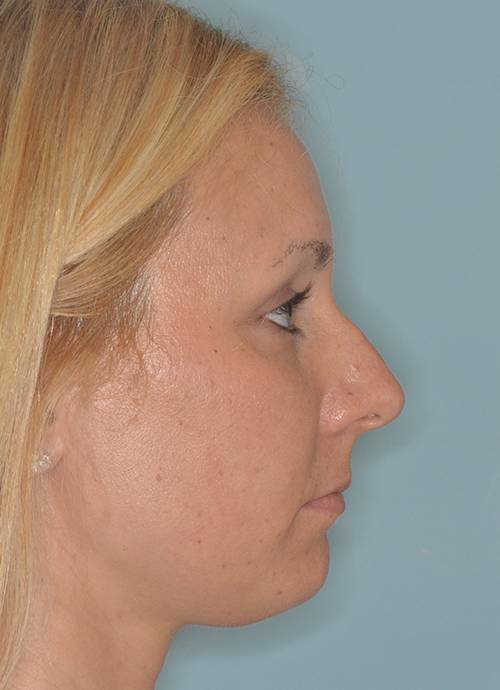 A chin implant was also placed to for profile alignment. 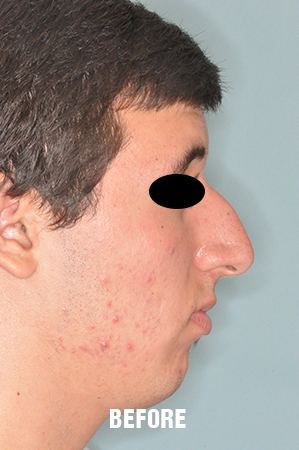 Seen here are his 9 month post-operative results. 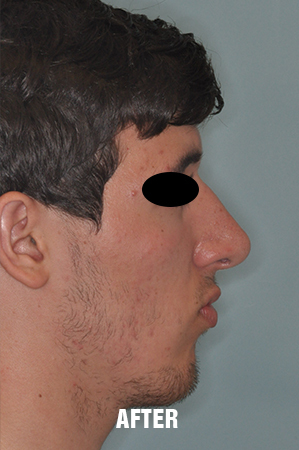 Primary rhinoplasty for tip refinement. 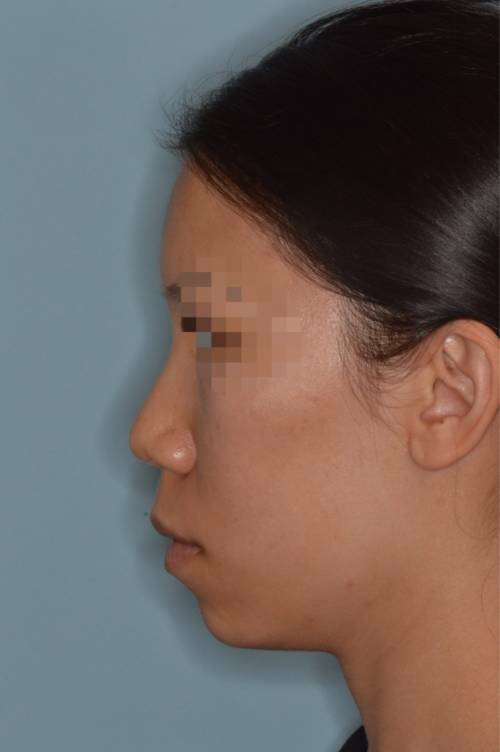 Techniques included bilateral osteotomies, caudal septal extension graft, lower lateral cartilage repositioning with lateral crural strut graft and tip onlay graft. 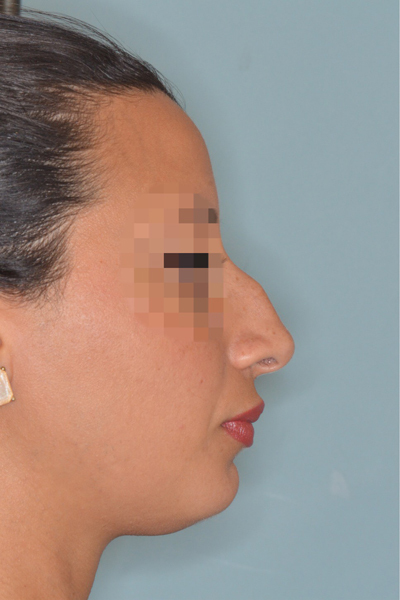 Patient with crooked nose deformity. 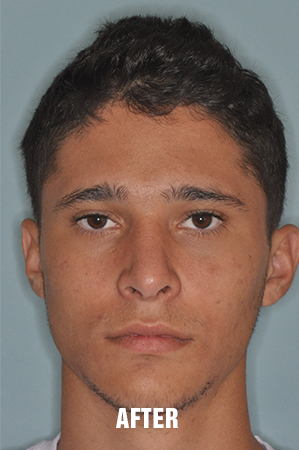 His nose was deviated to the right side and with difficulty breathing. 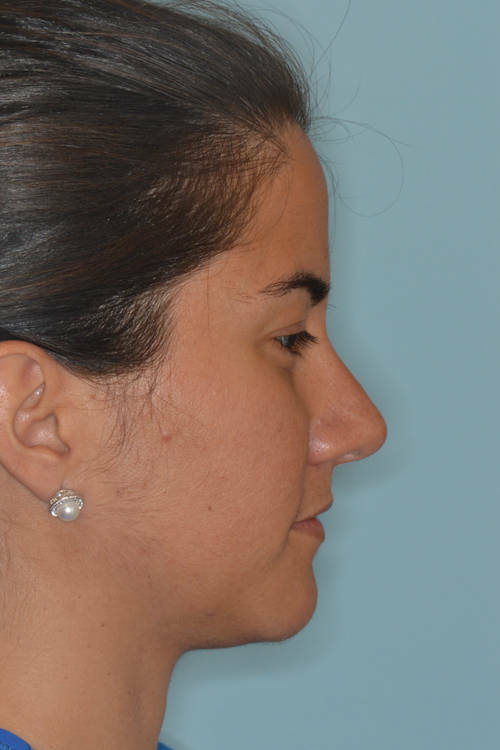 Did not desire any cosmetic changes to the nose other than the straightening of the nose. 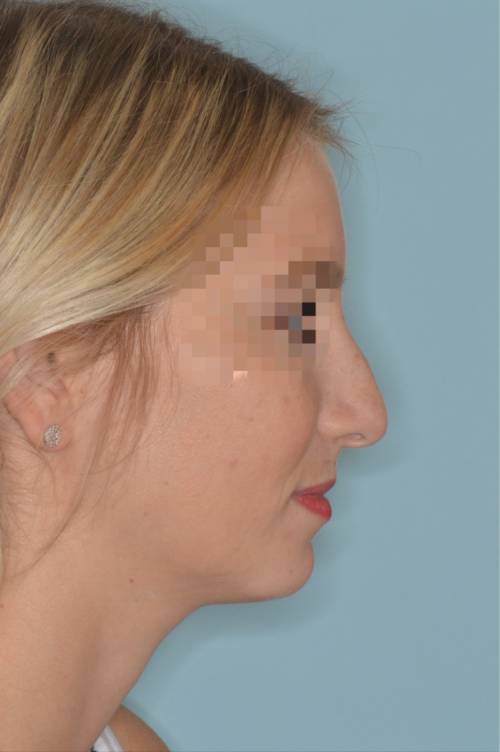 Primary rhinoplasty techniques entailed a right osteotomy, bilateral spreader graft placement using the “push/ pull” technique, and a left batten graft. 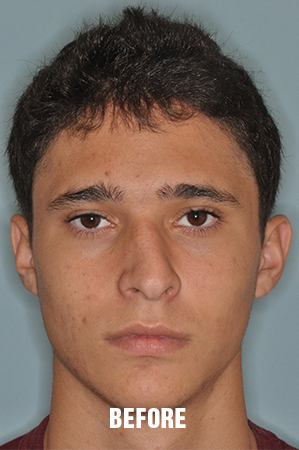 3 months post-operatively he is seen with correction of the nasal deviation. 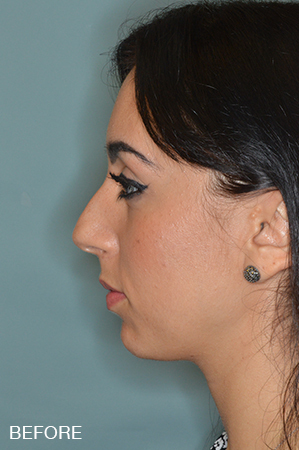 Base view before and after surgery also shows improvement in the symmetry of the nostril shape. 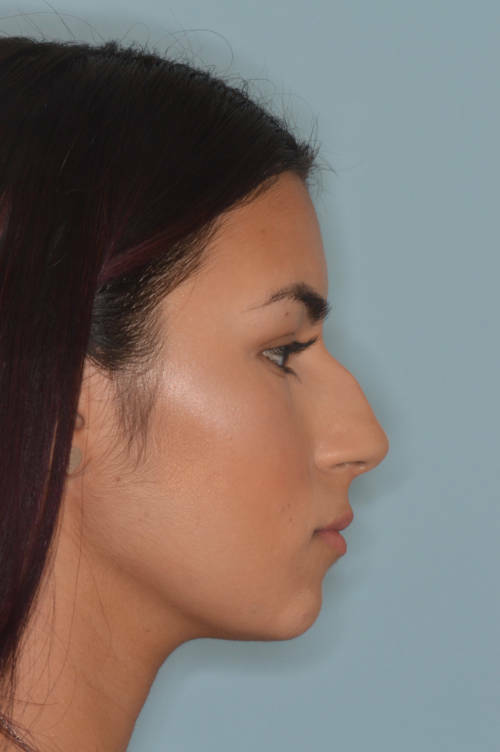 No changes were made to the profile. 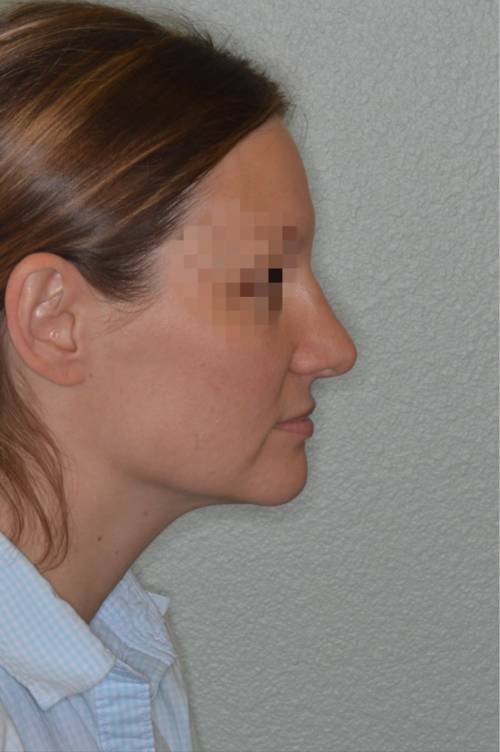 Patient with concerns of wide tip and hump on the profile view. 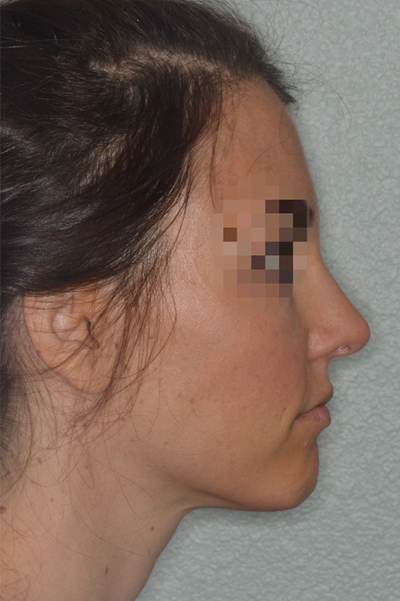 Open rhinoplasty techniques include hump reduction, osteotomies, bilateral spreader grafts, caudal septal extension graft and tip onlay grafts. 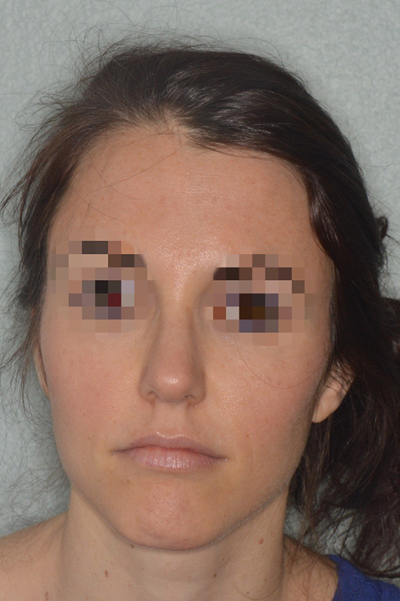 Seen here are her 8 month post-operative results. 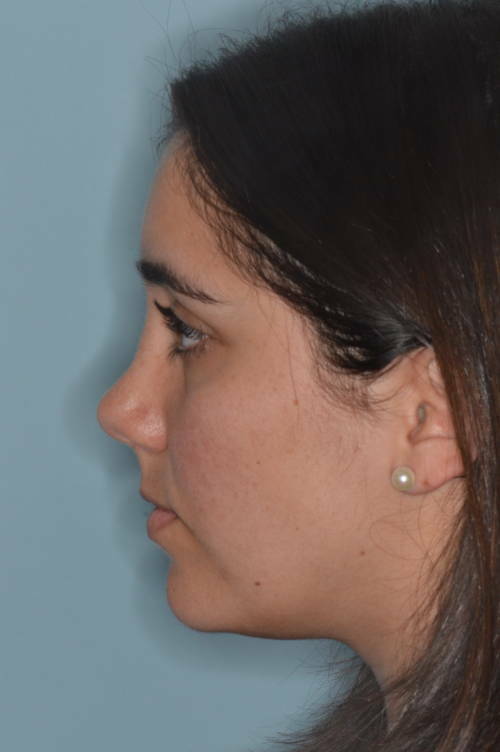 Patient who desired an overall thinner nose from the front and tip elevation on the profile view. 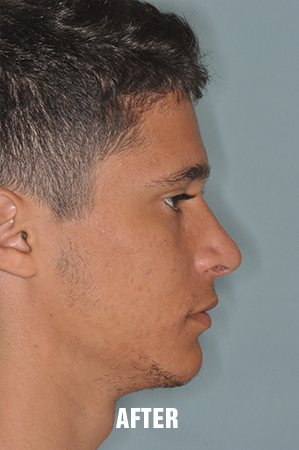 Challenging case with very wide nasal bones and tip cartilages with thick nasal skin. 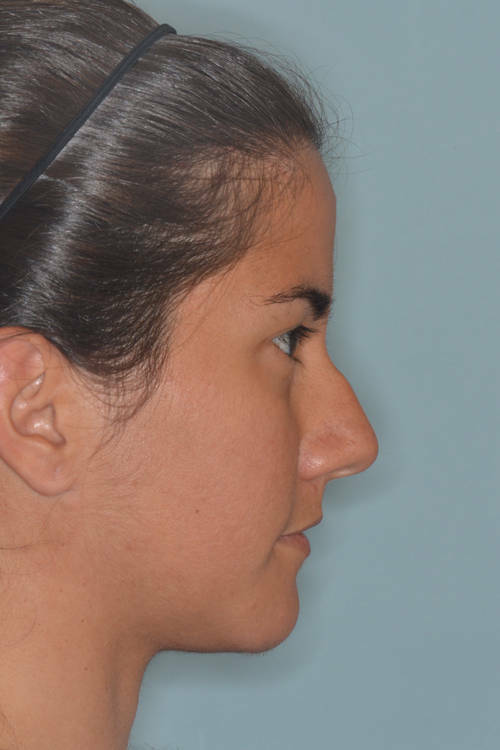 Primary open rhinoplasty techniques included both medial and lateral osteotomies for maximal nasal bone narrowing. 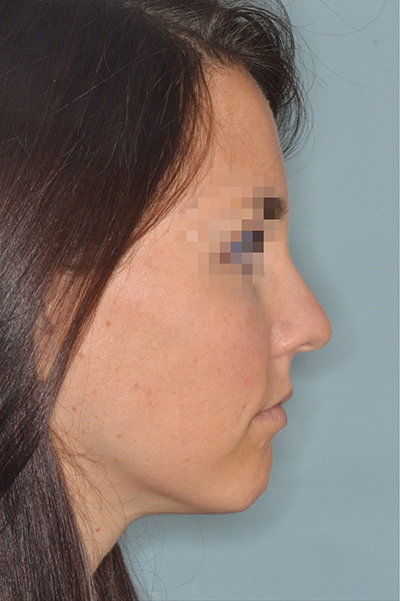 The tip cartilages were repositioned with placement of lateral crural strut grafts and tip onlay grafts. 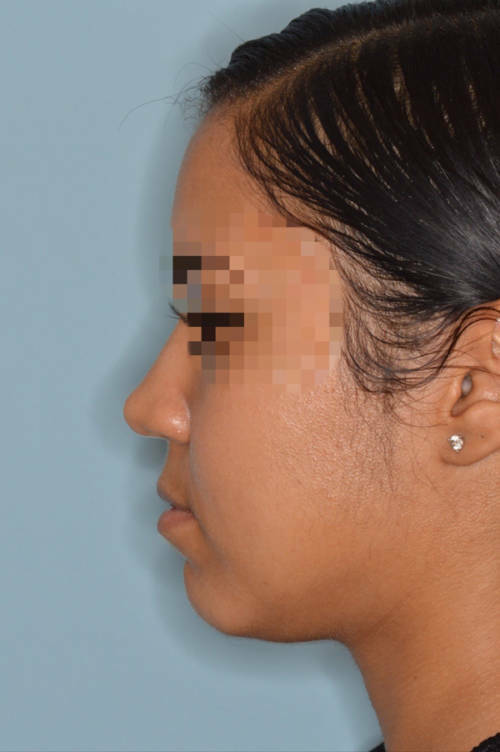 The tip cartilages were re-oriented to provide for narrowing of the tip while preserving a natural tip appearance given the orginal ultra wide tip cartilage orientation. 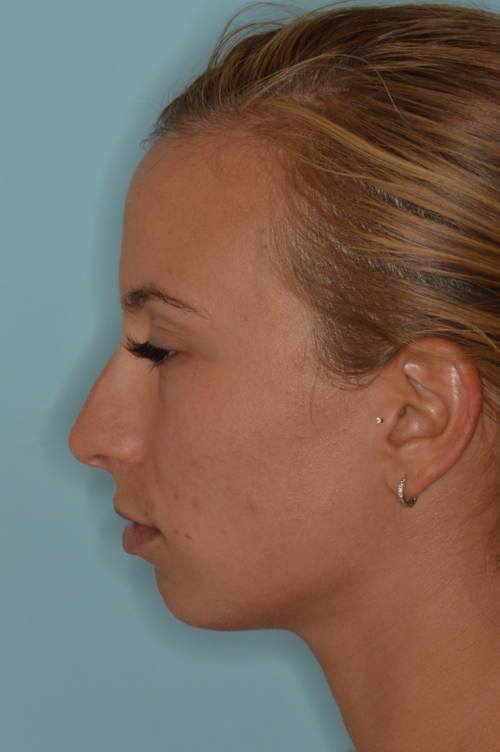 Base view of the nose shows the boxy tip cartilage prior to surgery. 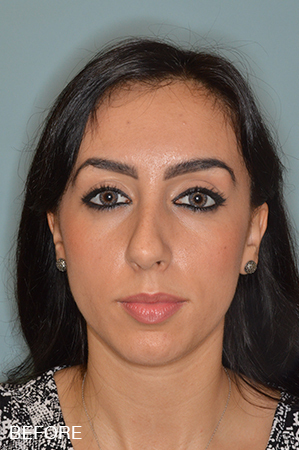 Tip support with caudal septal extension graft. 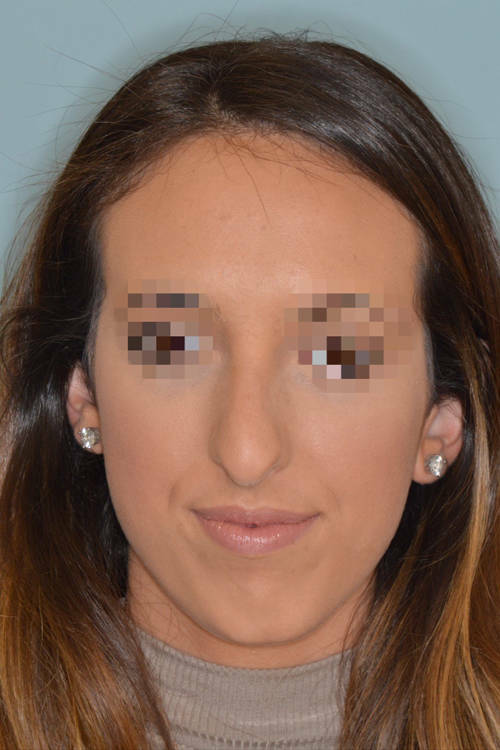 She is seen 6 months post-op. 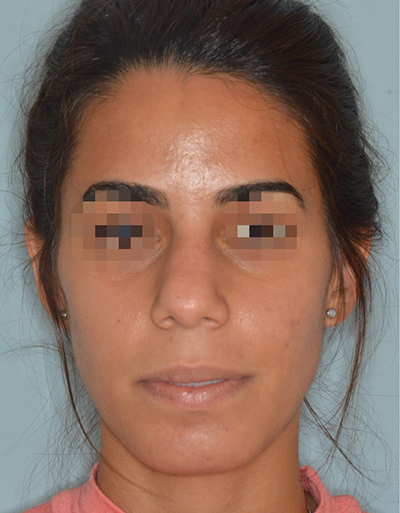 Before and after primary rhinoplasty on a female patient with the primary complaint of the over-projection of her bridge. 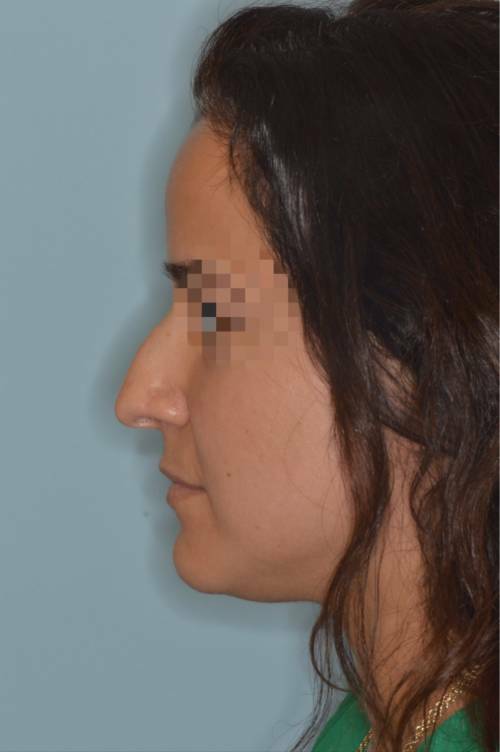 Primary rhinoplasty techniques included hump reduction, osteotomies, bilateral spreader grafts, and caudal septal extension graft for tip support. 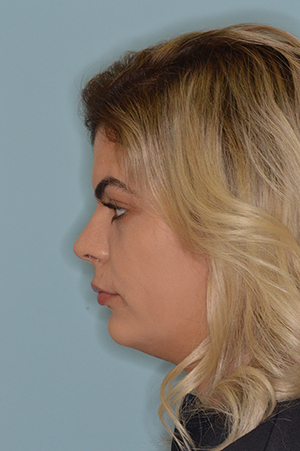 Primary rhinoplasty and chin implant for a patient with very thin skin whose concerns included over-projection of her nose. 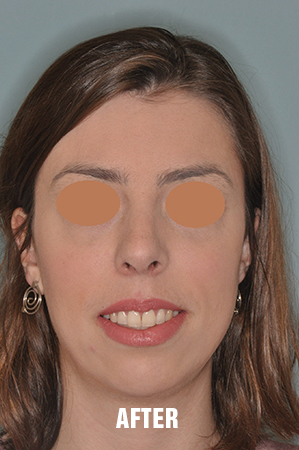 Techniques included hump reduction, bilateral spreader grafts with double spreader grafts on the left side to address her bridge. 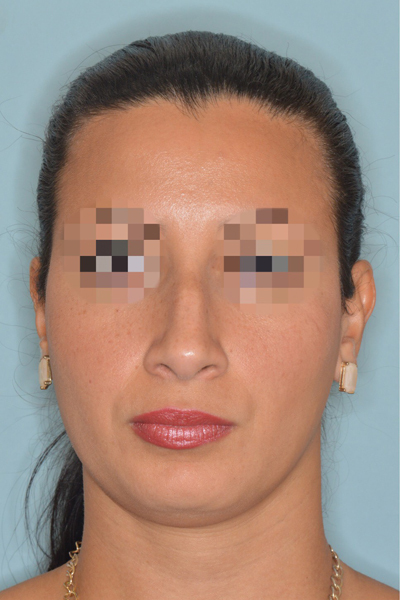 Tip setback using caudal septal extension graft and onlay grafts. 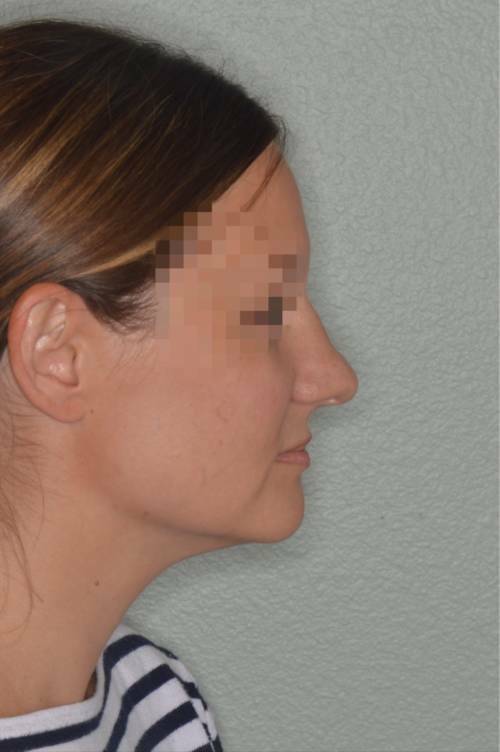 Medium, silastic chin implant was also placed to balance her profile. 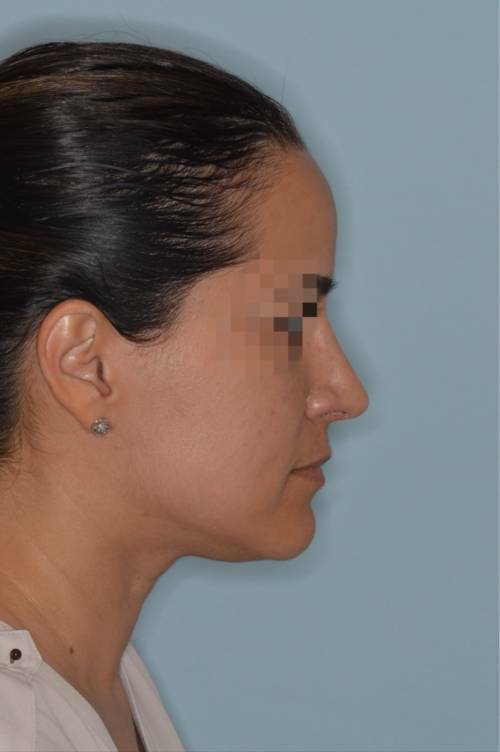 Patient with a undefined and boxy tip seeking refinement to her tip and the straightening of her profile. 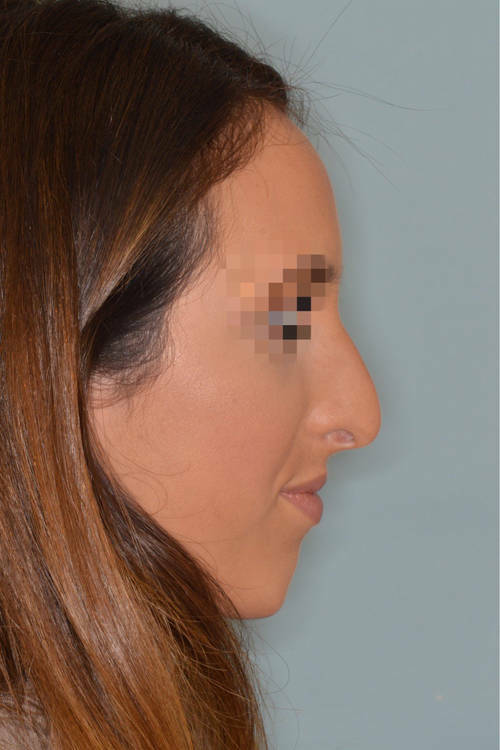 In this case the tip was refined with onlay tip grafts using crushed cartilage and the root of the nose (the radix) was raised using cartilage grafting which gave the profile a straighter appearance and alignment with the tip. 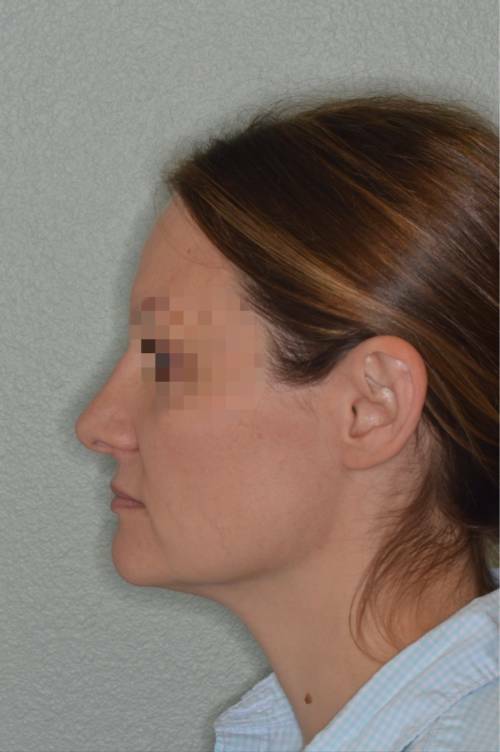 Patient whose concerns include the over-projection of her tip and bridge on the profile view as well as the bulbous tip appearance on the front view. 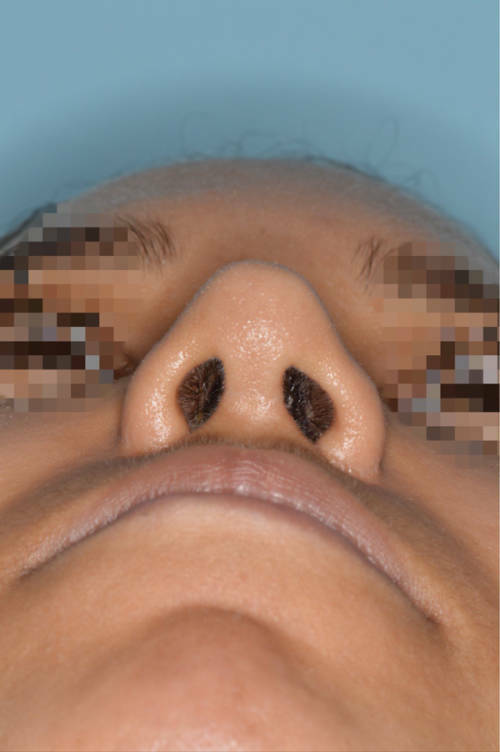 Primary rhinoplasty techniques included bilateral osteotomies, bilateral spreader grafts, caudal septal extension graft, tip onlay graft, and batten graft. 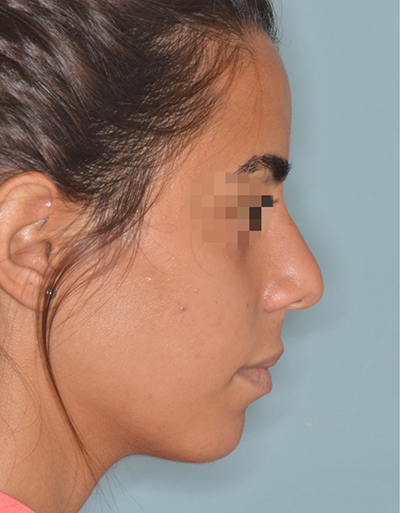 Challenging primary rhinoplasty female patient who presented with nasal blockage and cosmetic complaints regarding her nose. 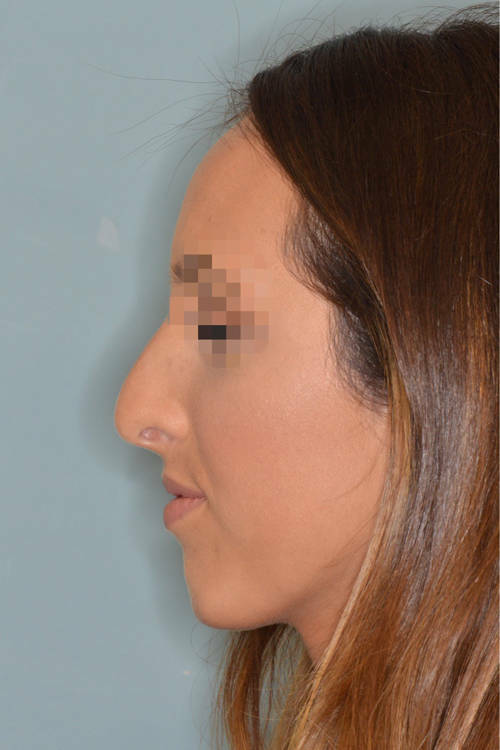 She found her nose to be large and with a crooked appearance. 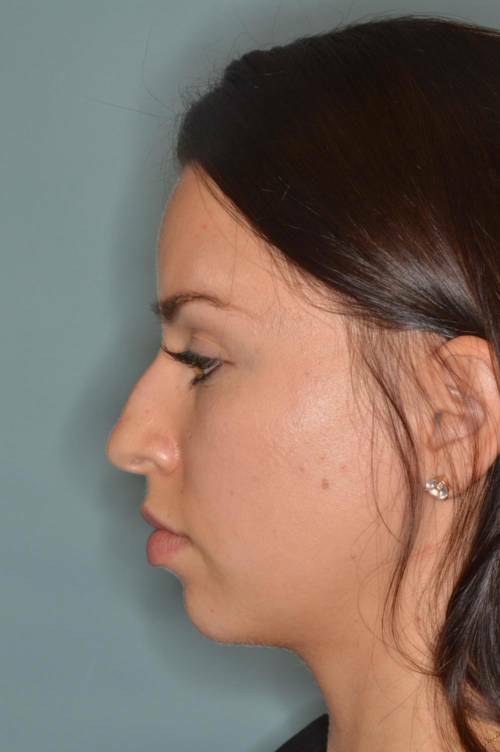 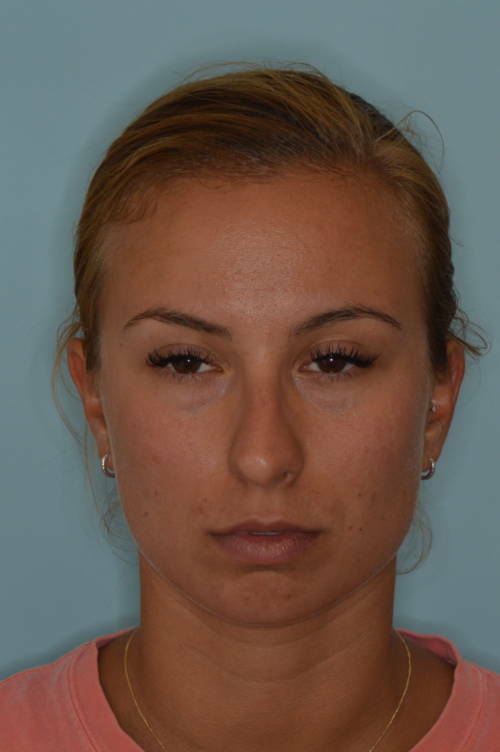 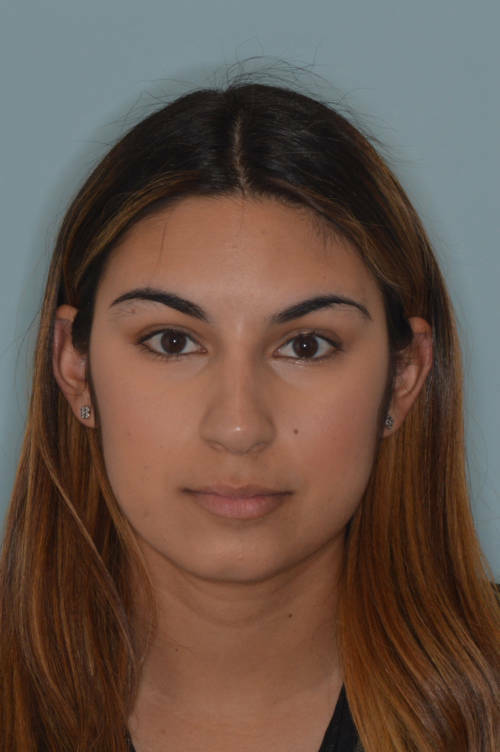 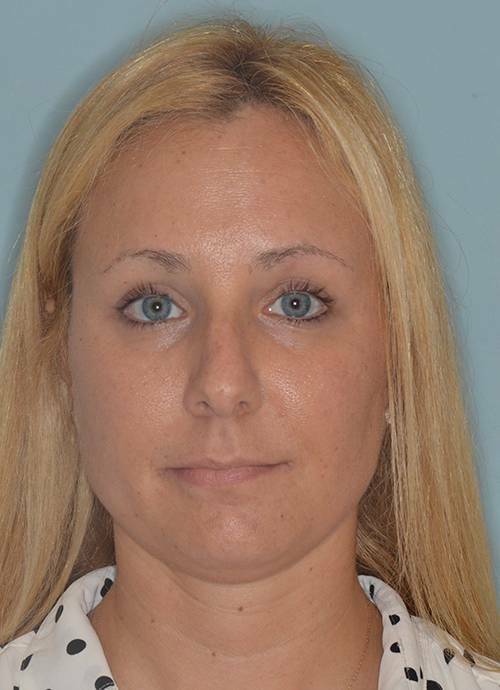 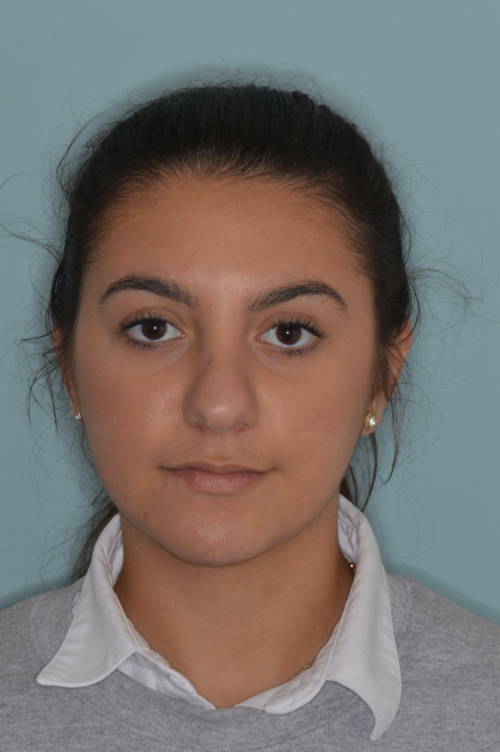 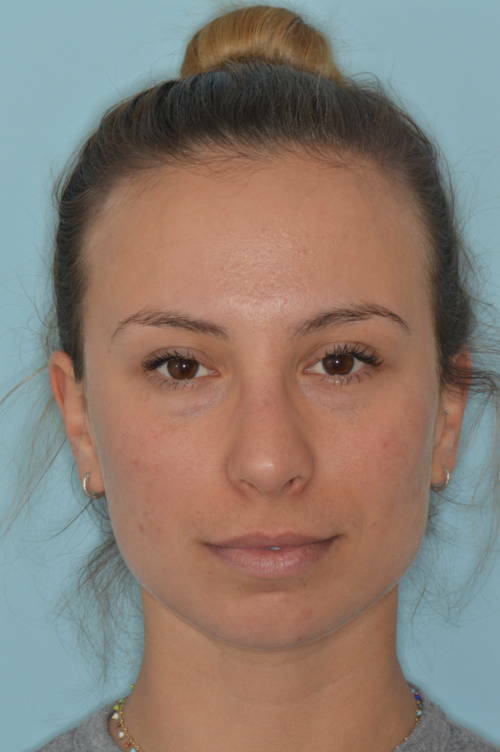 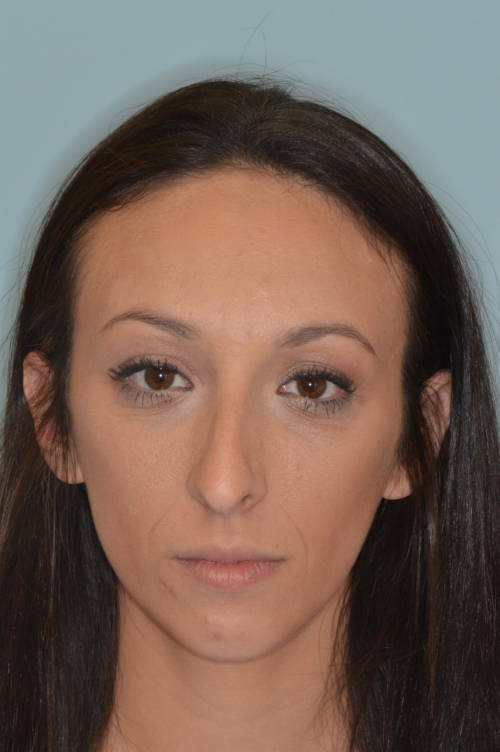 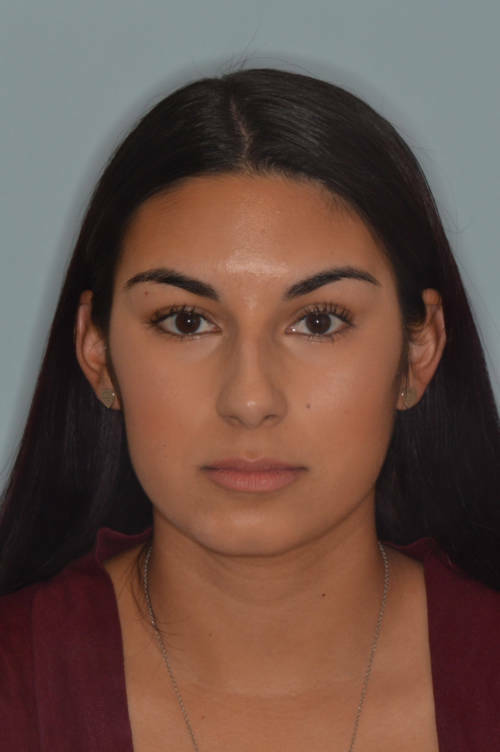 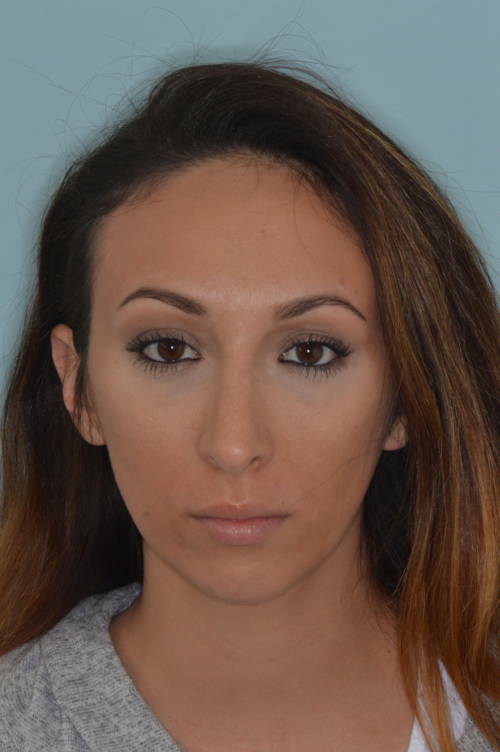 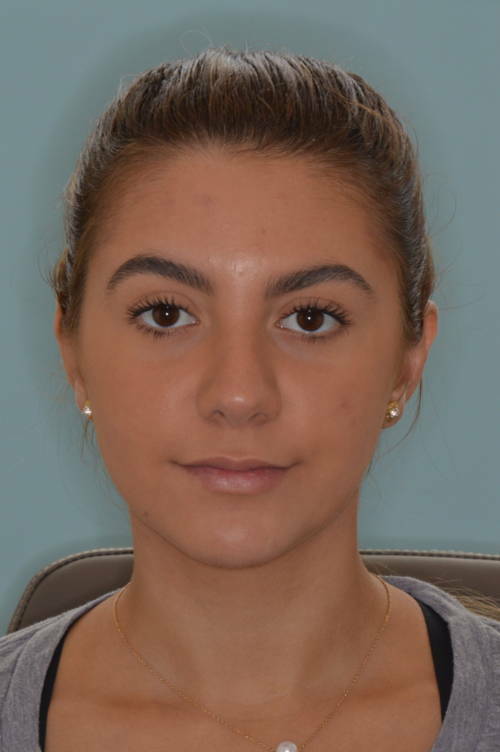 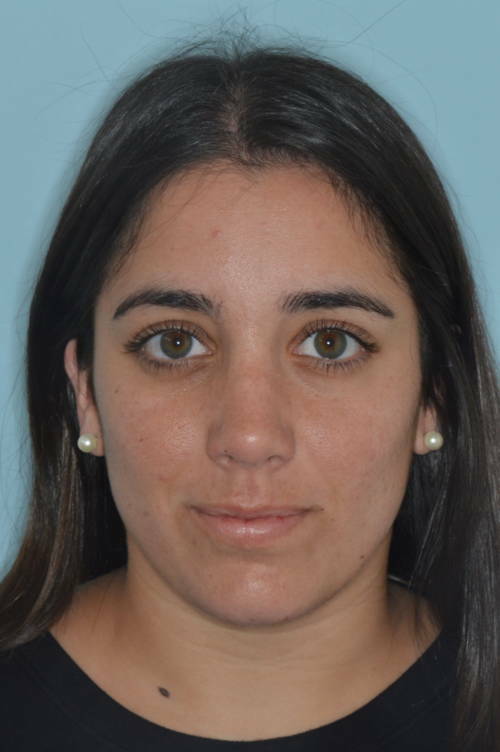 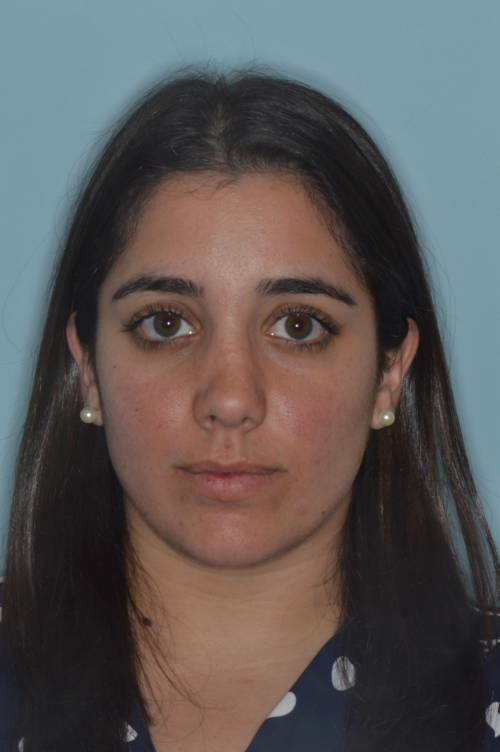 She was found to have a significantly deviated septum and an external deviation of her nose to the right side. 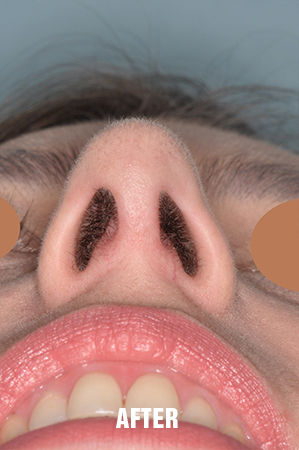 Complicated primary rhinoplasty which included a septoplasty, placement of spreader grafts, removal of nasal hump, tip setback through a tongue and groove technique, and tip domal suturing. 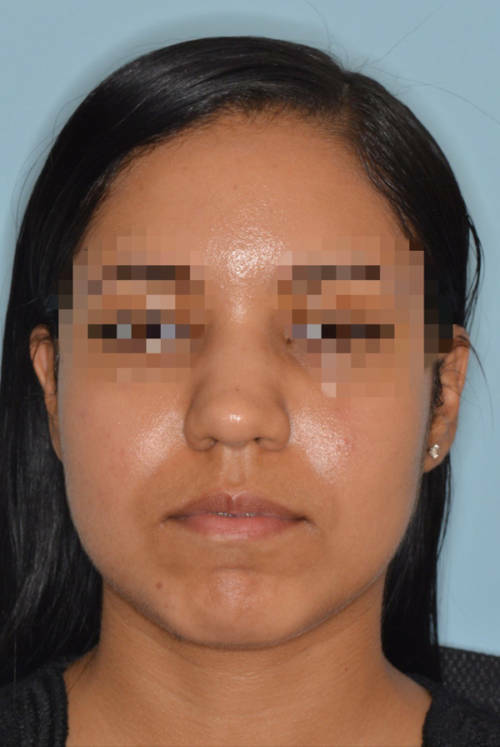 Postoperatively, patient now without nasal breathing problems, nose straight externally, profile alignment with straight dorsum, and natural tip refinements on frontal view. 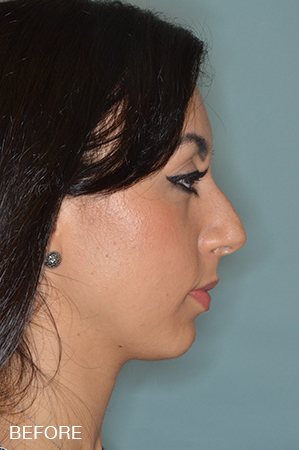 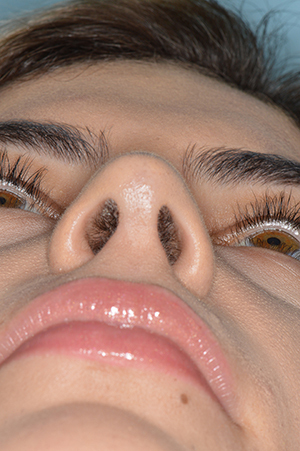 Base view demonstrates the tip refinements achieved while maintaining nostril symmetry. 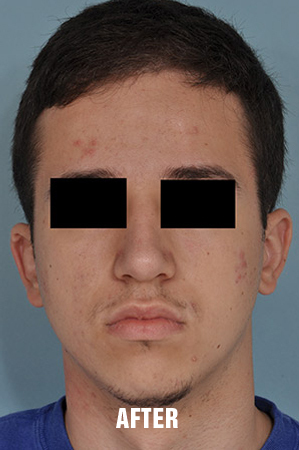 A 18 year old male with distant history of nasal trauma. 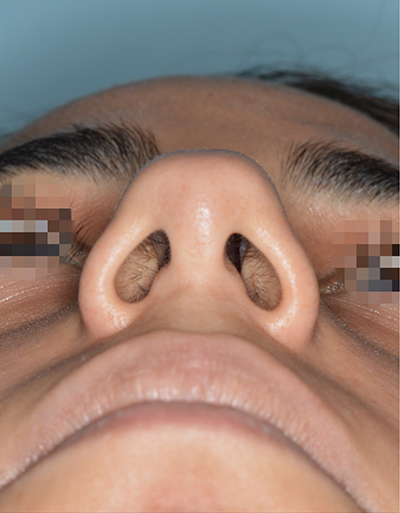 Presents complaining of bilateral nasal obstruction and crooked nasal deformity. 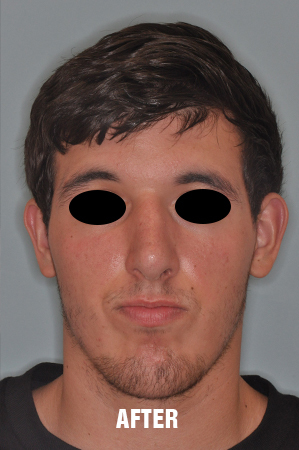 He was found to have a severely deviated septum and an external nasal deviation. 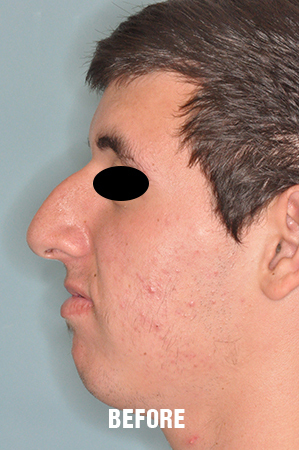 Challenging primary rhinoplasty which included septoplasty, hump reduction, spreader grafts, and batten grafts. 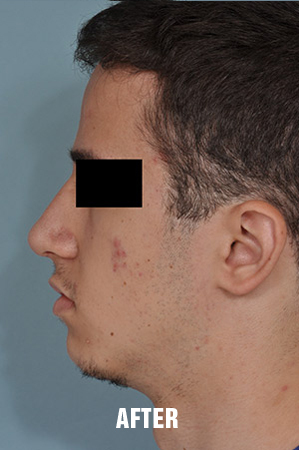 Post-operatively his nasal obstruction was corrected. 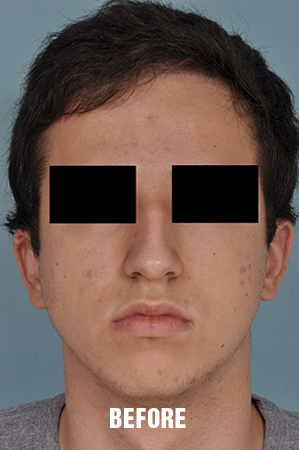 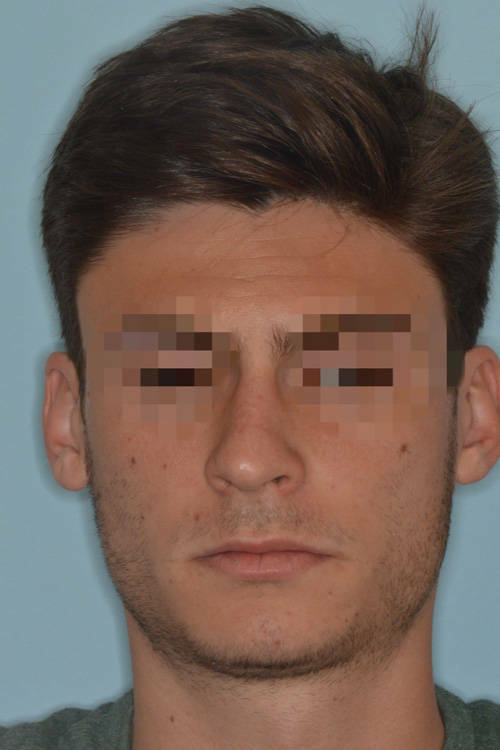 On the frontal view, an improvement in his nasal deviation is evident. 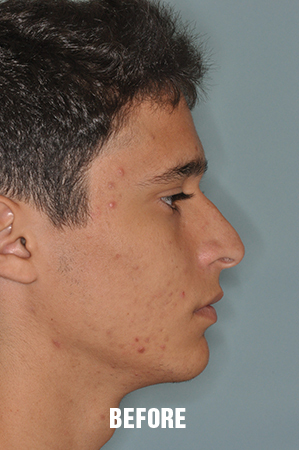 Lateral view shows reduction of his hump with profile alignment. 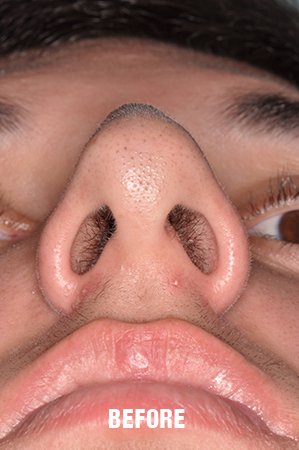 Base view reveals a triangular shape, nostril symmetry as well as improvement of his nasal deviation. 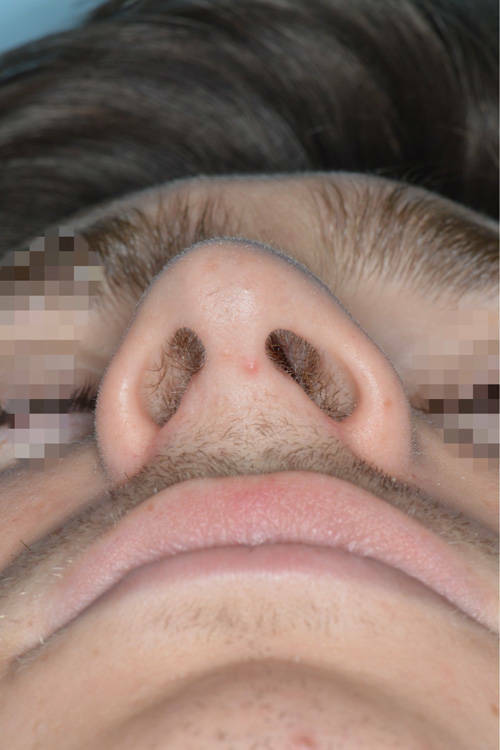 18 year old male who desired to reduce the size of his nose. 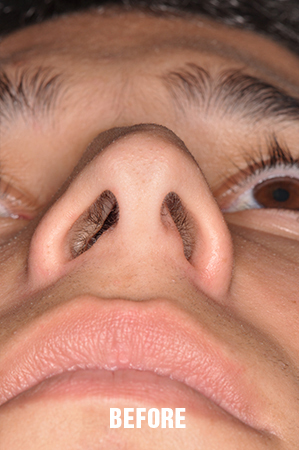 He also complained of not breathing well from one side of his nose. 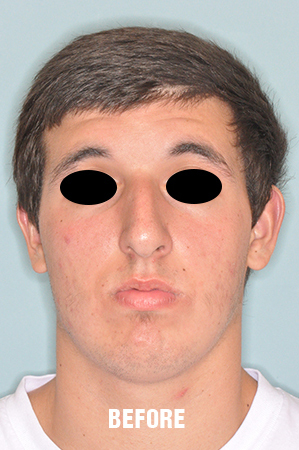 He was found to have a deviated nose and a deviated septum. 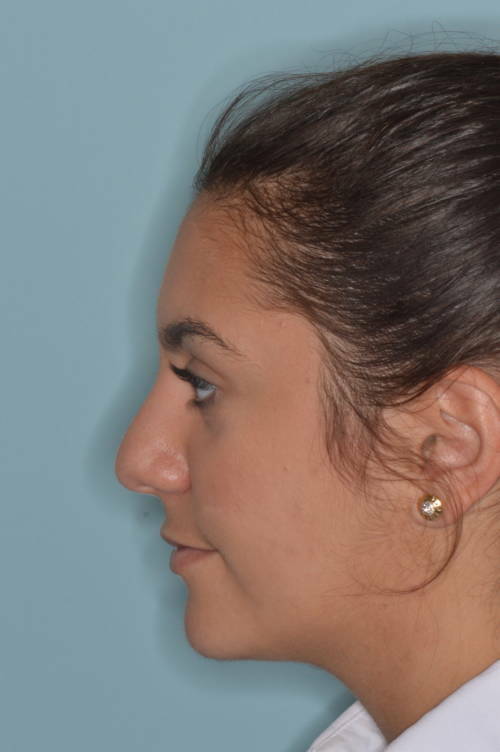 These were corrected with a septoplasty and an open approach to rhinoplasty. 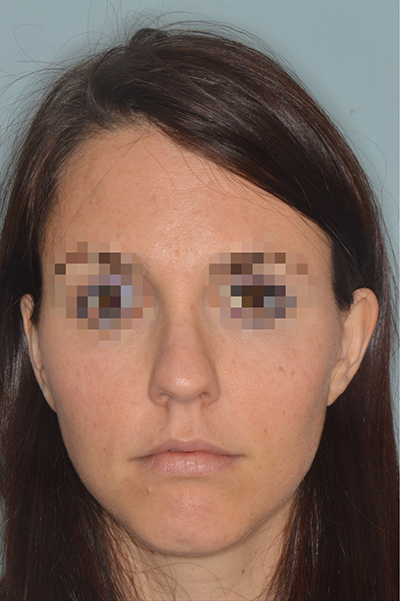 The pictures provided are 1 month after surgery.